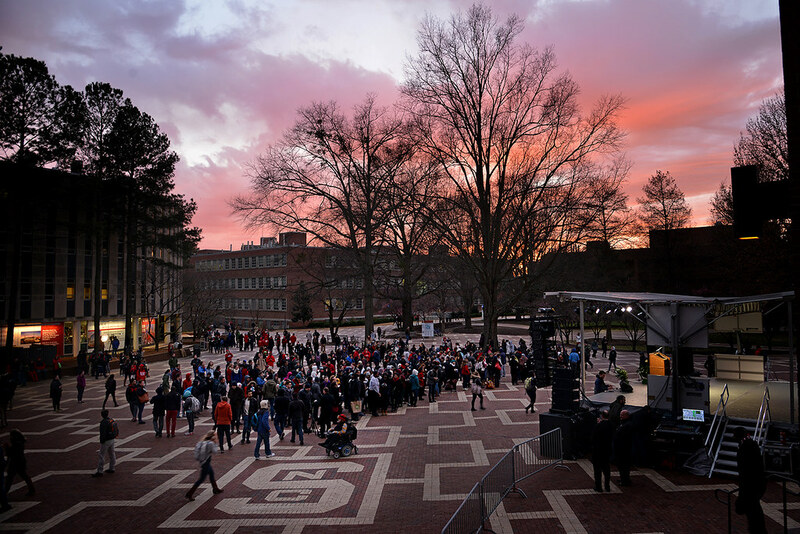 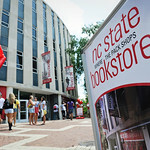 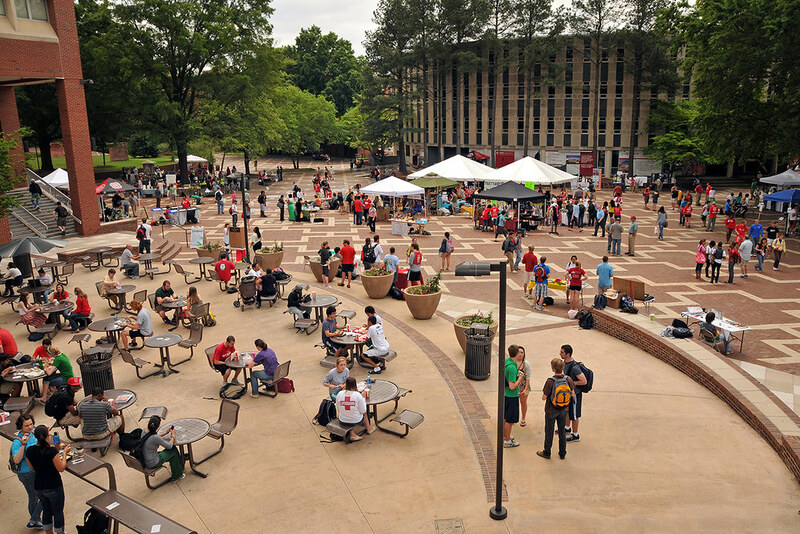 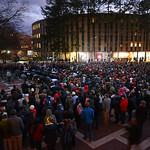 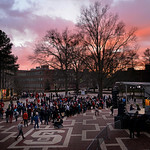 OFFICIALLY NAMED “UNIVERSITY PLAZA,” it is a hallowed place where the NC State community has criss-crossed, congregated and celebrated for decades. 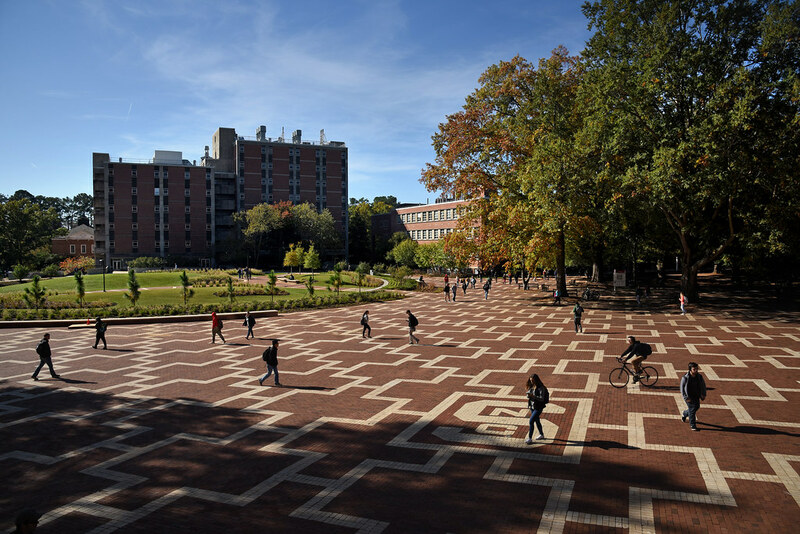 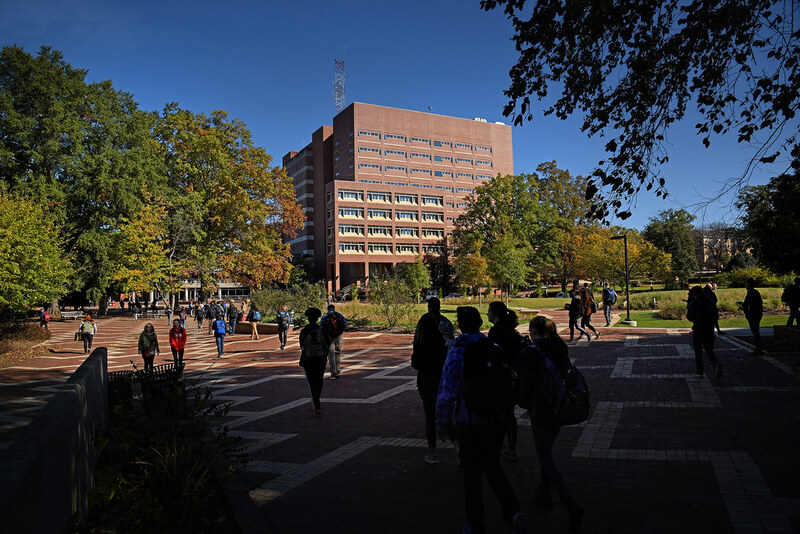 University Plaza, commonly called the Brickyard by most, is one of nine Hallowed Places on NC State’s campus, defined as "irreplaceable campus buildings, landscapes and natural settings that have accrued special meaning over time." 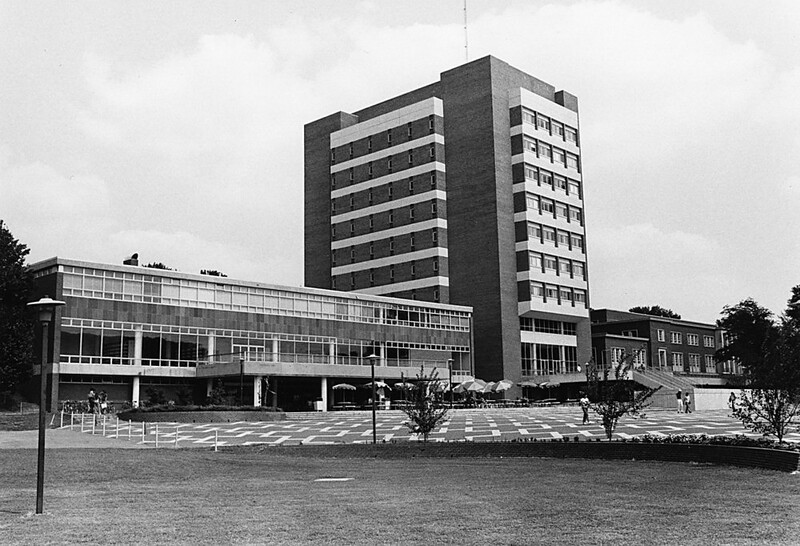 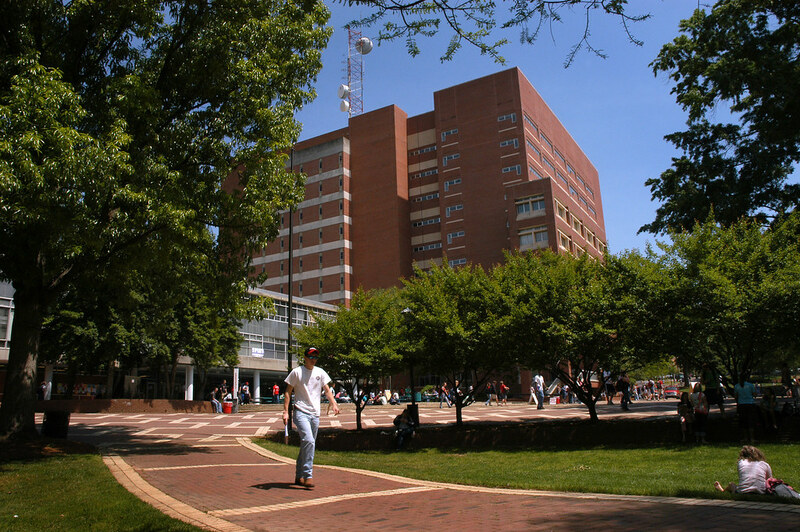 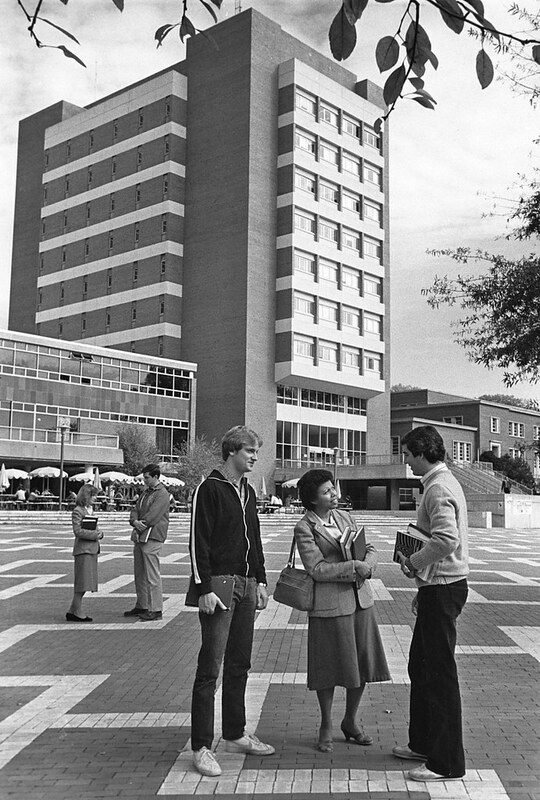 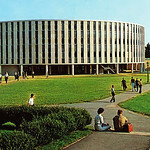 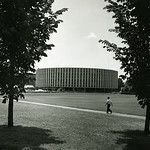 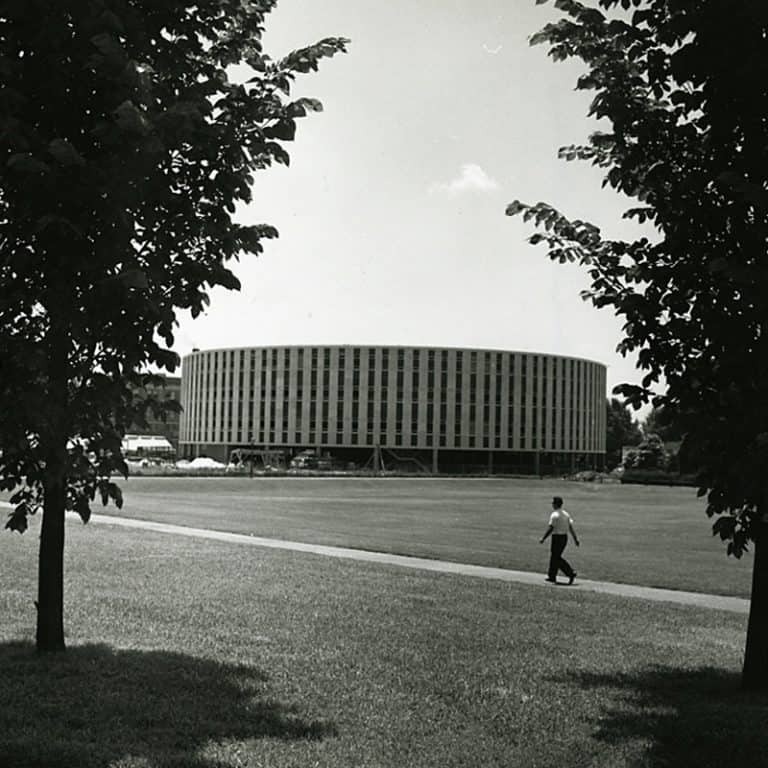 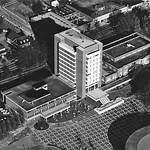 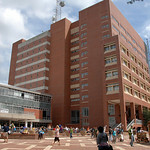 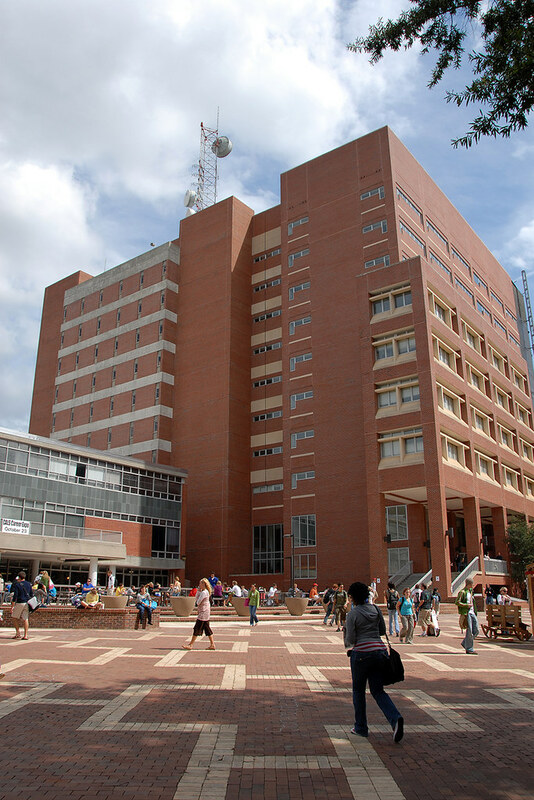 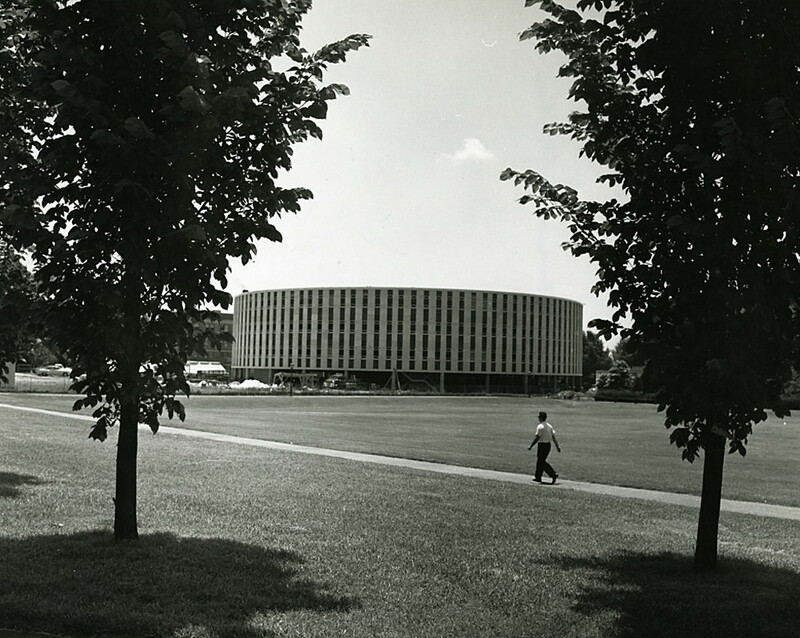 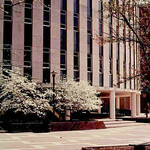 Harrelson Hall, the first cylindrical building on a college campus, was built in 1961. 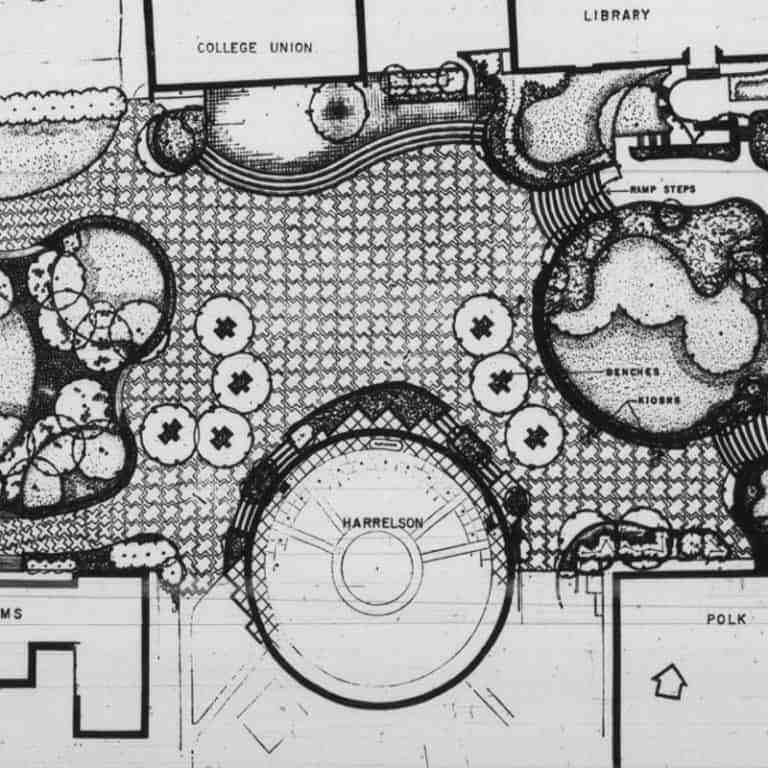 It needed a dramatic landscaped design. 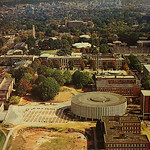 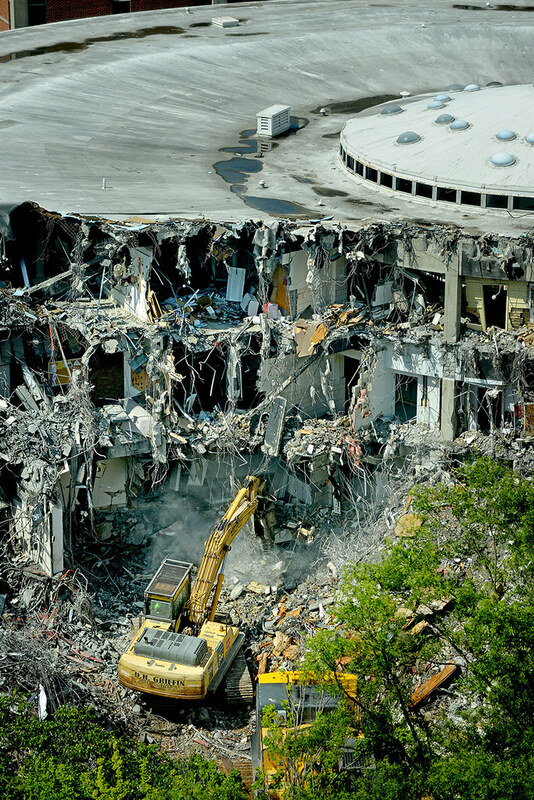 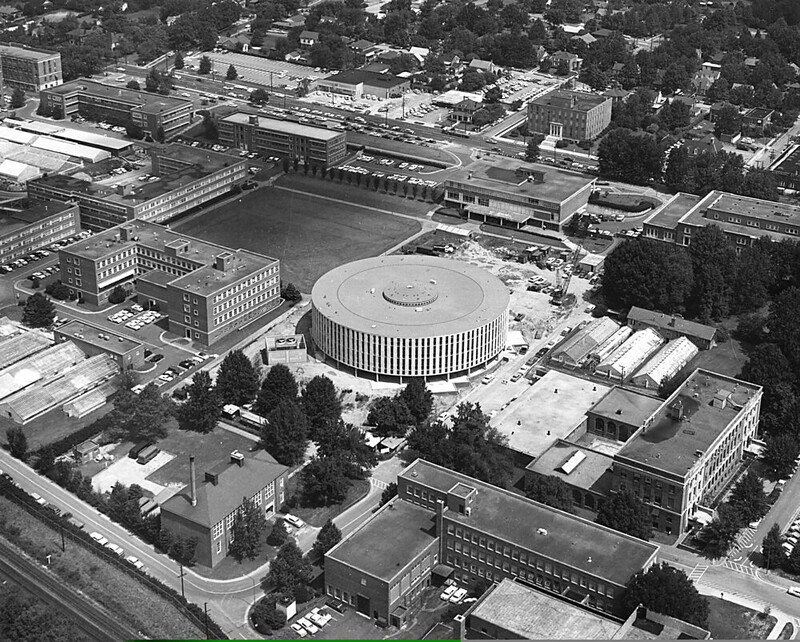 Once, it was an expanse of warped planks sitting atop the muddy red quagmire that separated the old Erdahl-Cloyd Student Center from the shiny cylindrical marvel called Harrelson Hall that rose near the railroad tracks on NC State’s main campus. 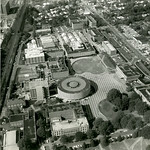 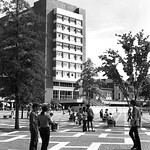 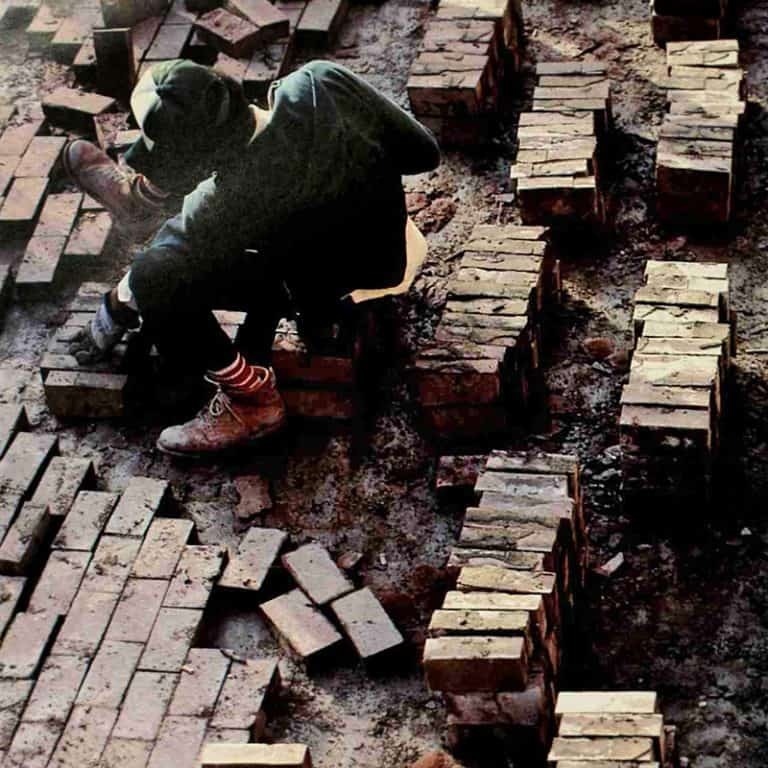 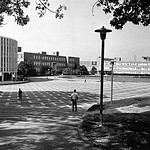 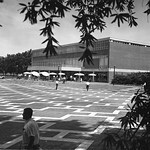 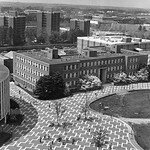 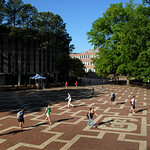 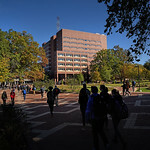 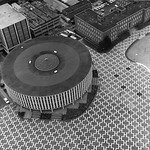 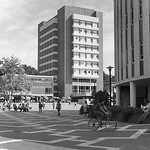 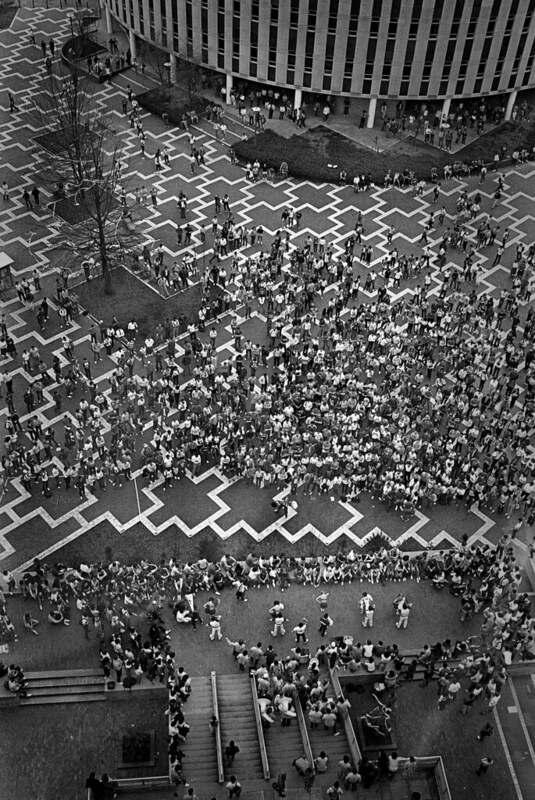 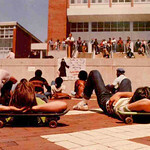 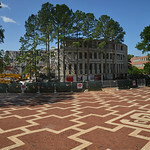 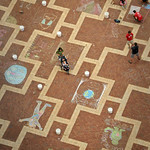 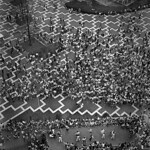 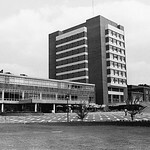 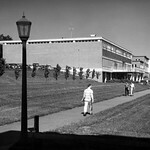 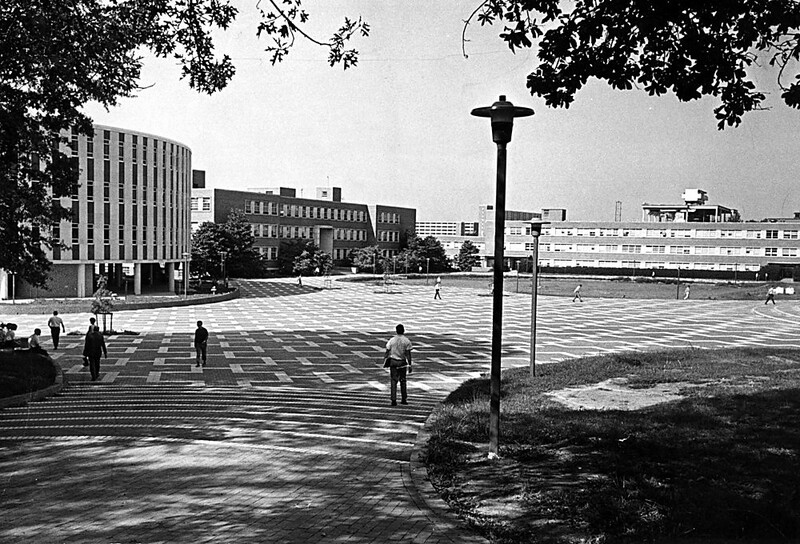 In 1966, however, NC State’s physical plant began paving the unsightly area with red and white bricks to create what the school wanted to call — and officially still does — the “University Plaza.” It was conceived by NC State College of Design graduate Richard C. Bell, who for years was Raleigh’s foremost landscape architect. 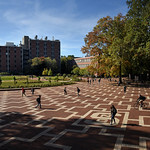 Almost immediately, it was dubbed the “Brickyard,” a name that was originally derisive but now is beloved as one of the school’s nine Hallowed Spaces. 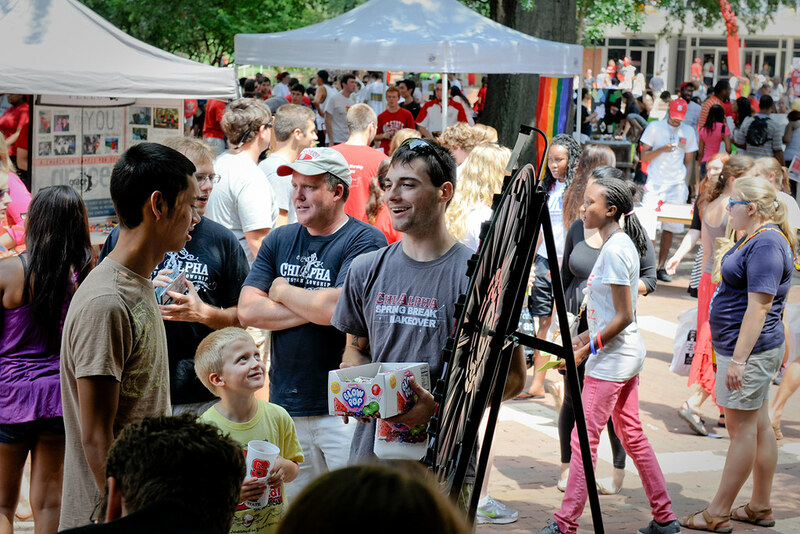 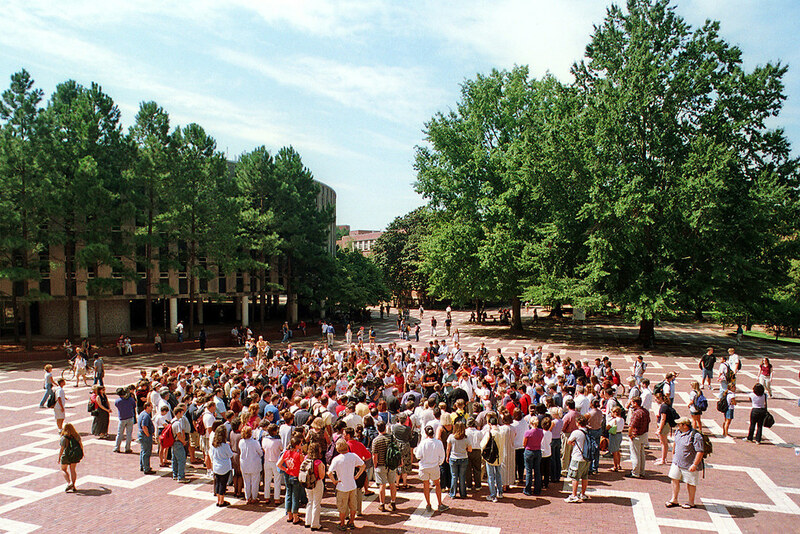 Generations of NC State students have used the Brickyard as a gathering place for celebrations, vociferous impromptu sermons, political rallies and protests, concerts, special events and a route from home to class to lunch. 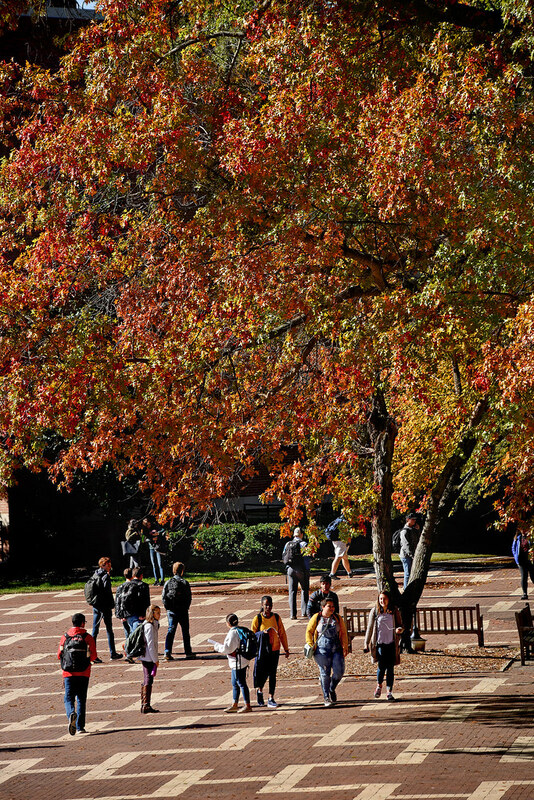 Yet this walkway is more than a place to rustle through the leaves of autumn, slip on a winter frost, watch spring’s bloom or bake on summer’s sun-heated kiln. 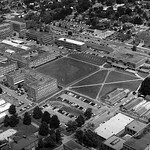 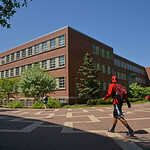 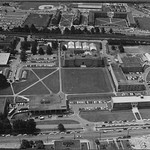 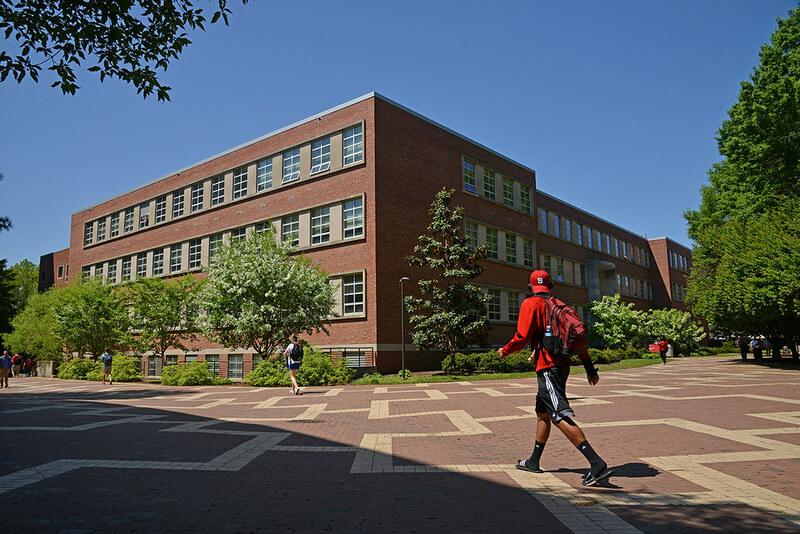 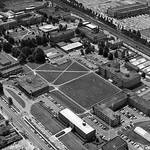 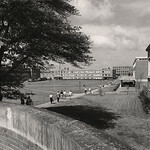 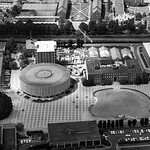 Through the years, the Brickyard has been a place of capacity and comfort, the central interchange on the academic side of campus where nearly every student crossed at some point during the day. 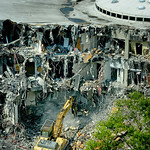 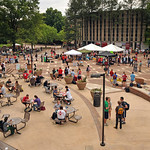 It has also served as a central gathering place for celebrations, social activities and remembrances. 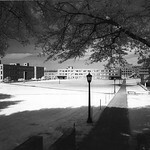 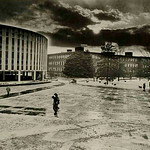 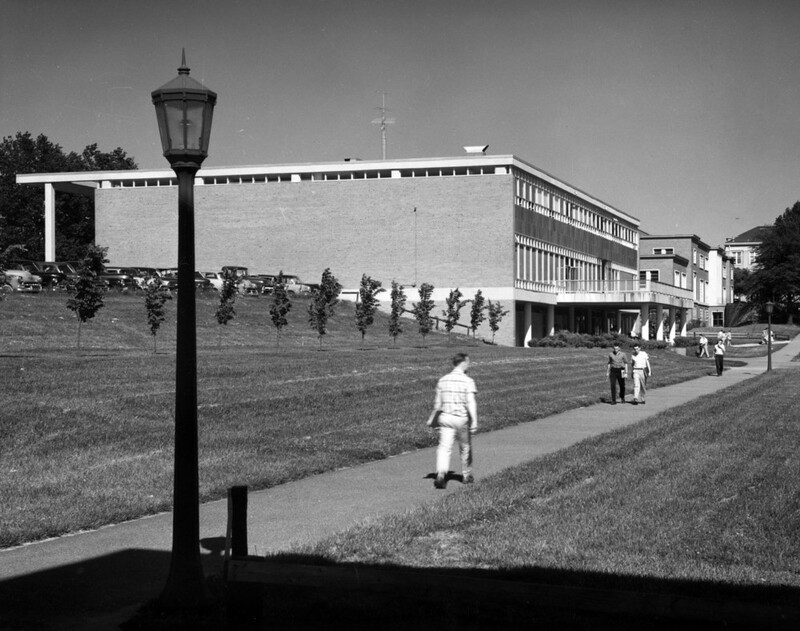 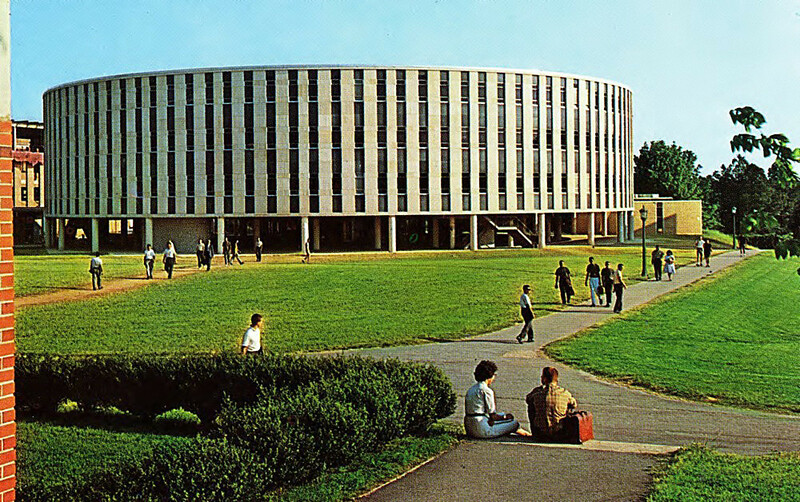 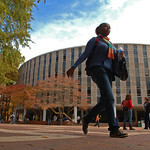 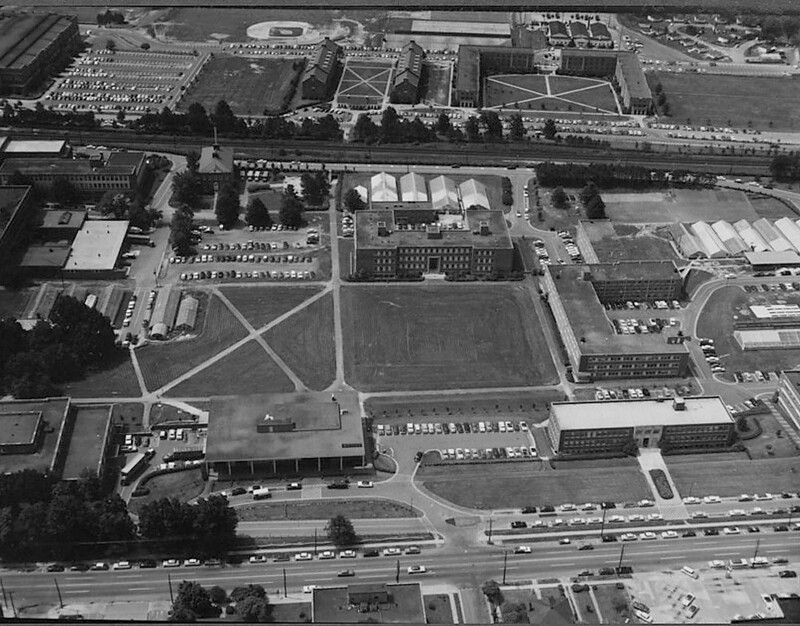 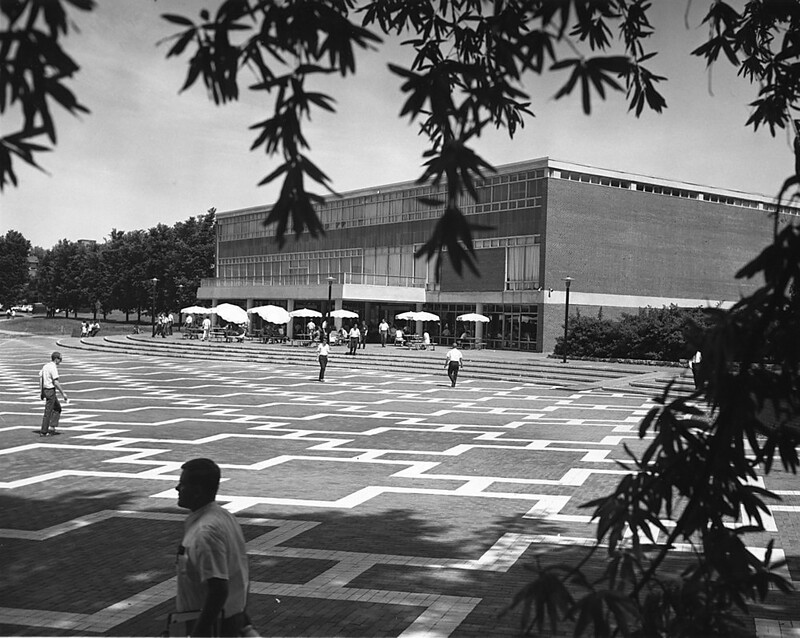 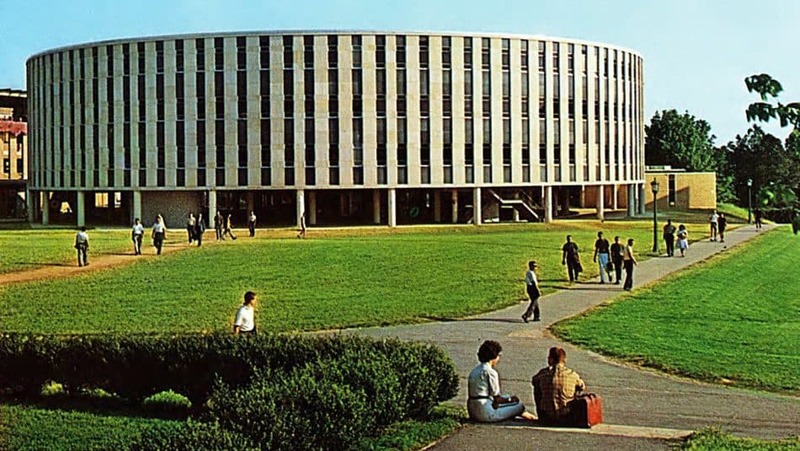 After Harrelson Hall was built in 1961, the plaza between it and the Erdahl-Cloyd Student Center was a grassy field with crossing footpaths. 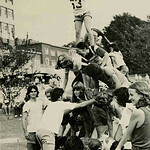 However, it often turned into a muddy mess when it rained. 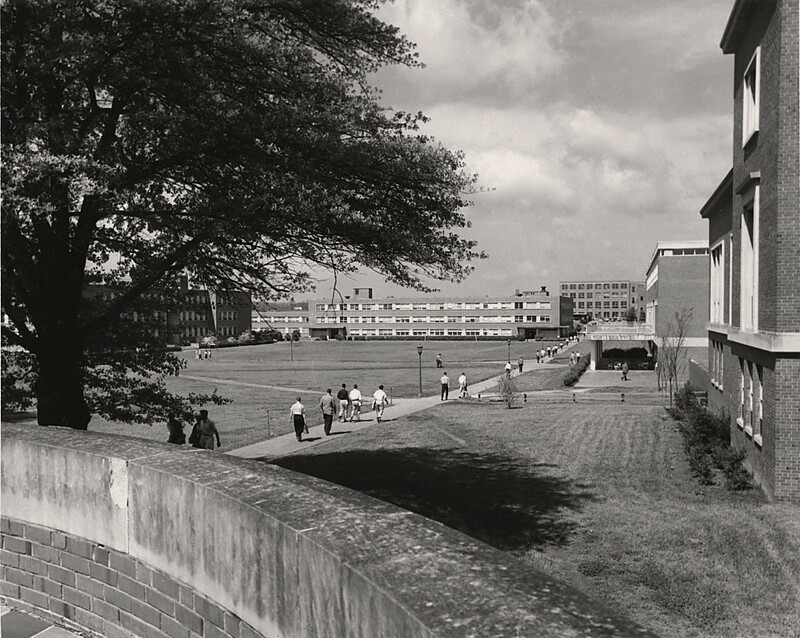 Temporary plank walkways were often used to avoid the quagmire. 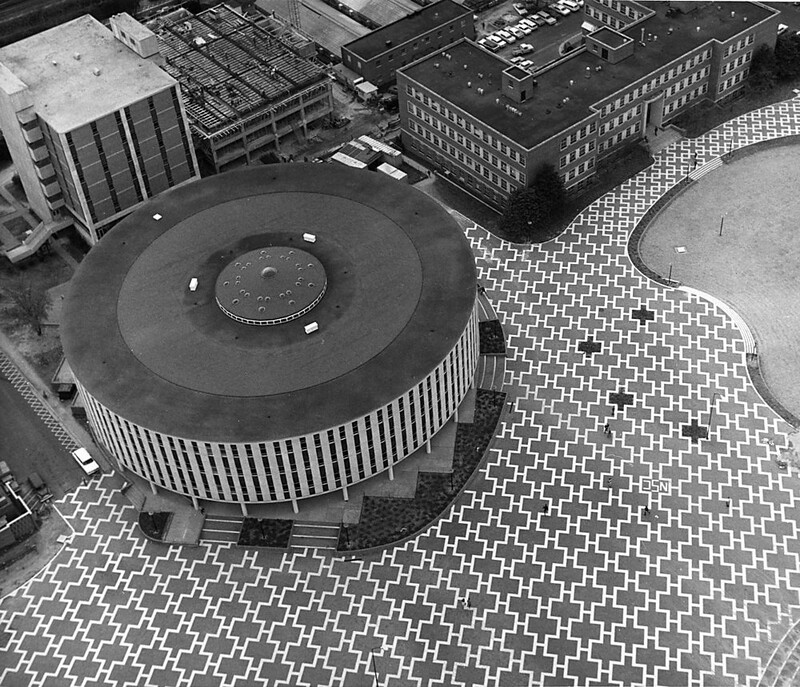 The original renderings of University Plaza by noted Raleigh landscape architect Richard C. Bell, a 1951 NC State graduate. 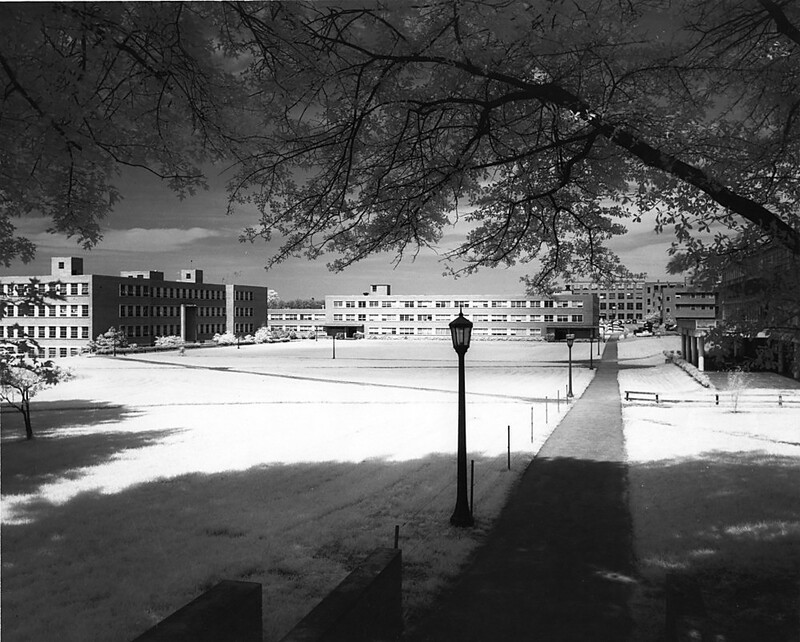 Similar drawings exist for other parts of campus north of the railroad tracks. 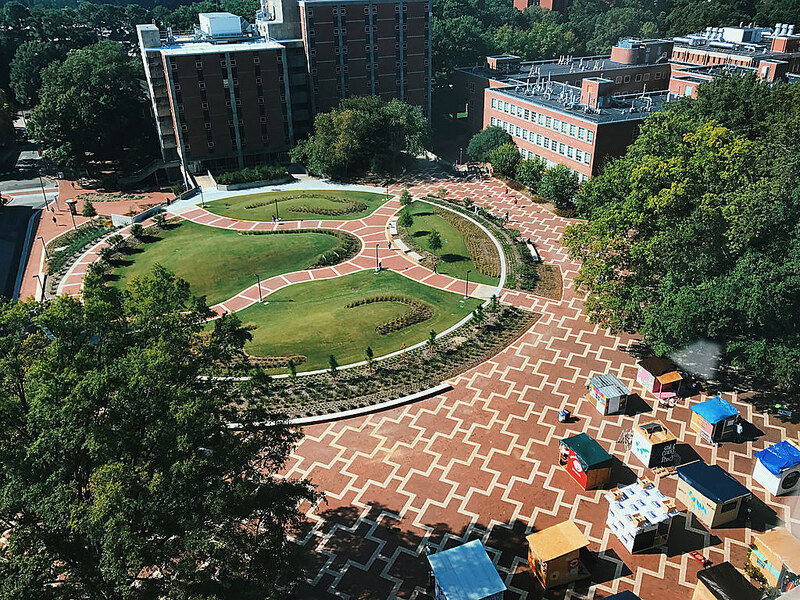 The pattern formed by the bricks — a total of 588,060 of them, all donated by the North Carolina Bricklayers Association — was reminiscent of the Piazza San Marco in Venice, Italy, one of the many international cities where Bell studied after graduating NC State in 1950. 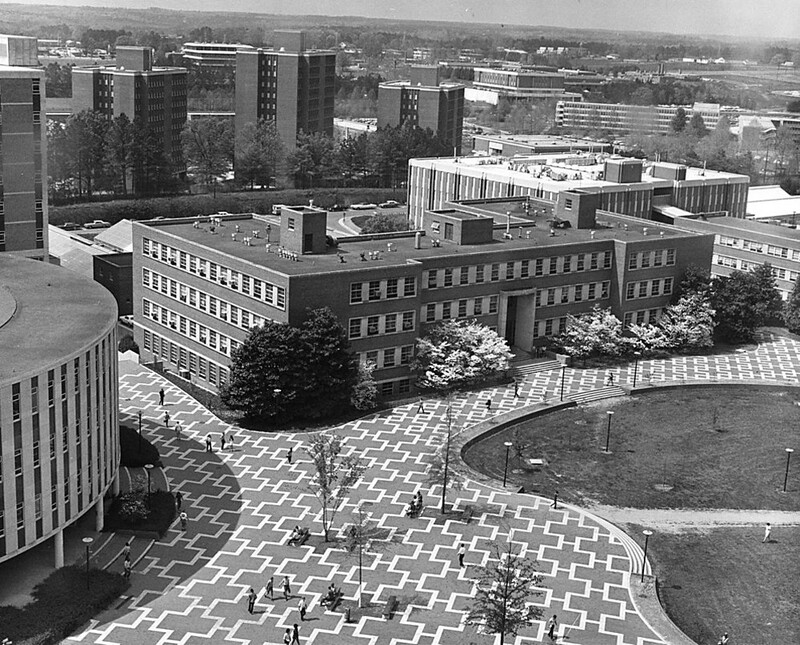 Bell’s original design called for the area to be paved with hand-cut granite cobblestones, but in-state manufactured bricks were much more plentiful — and free. 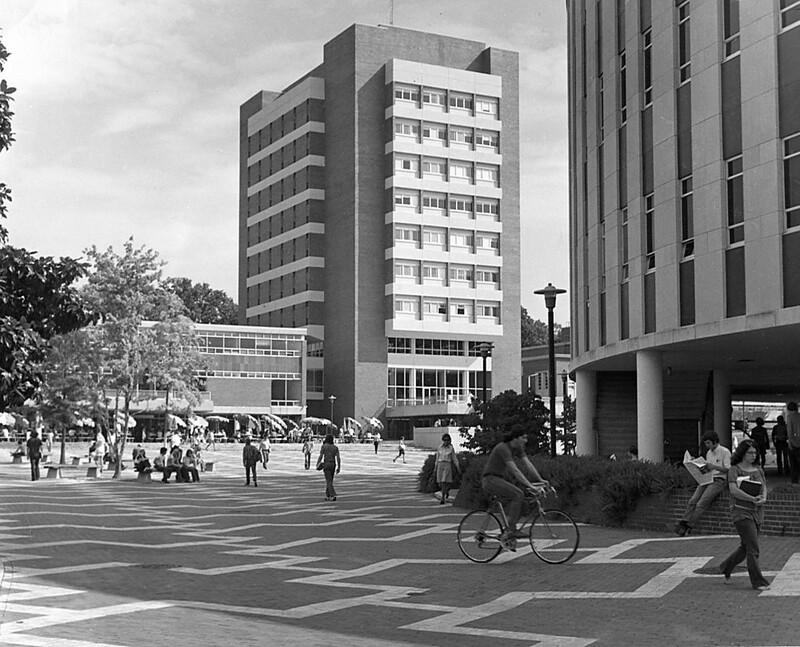 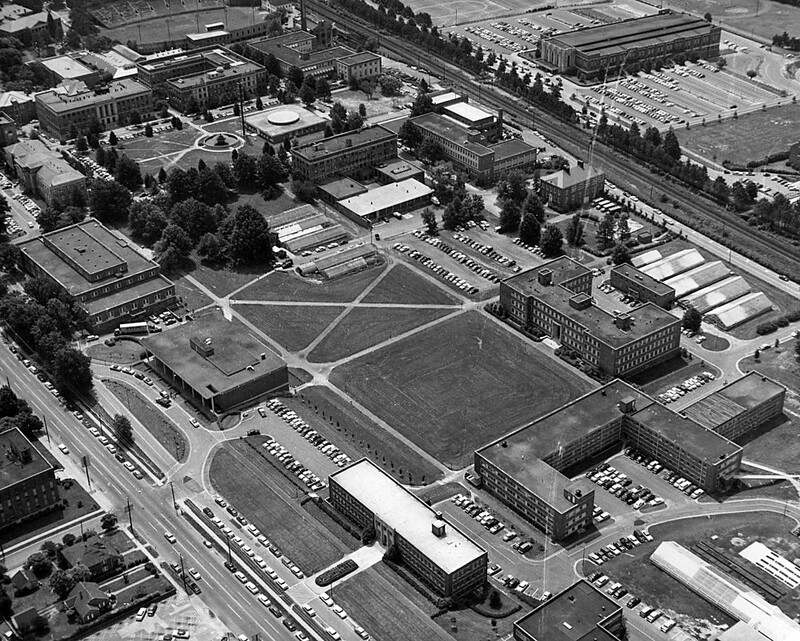 The plaza was planned to extend through the lilting landscape of campus all the way to the Belltower and down to Holladay Hall. 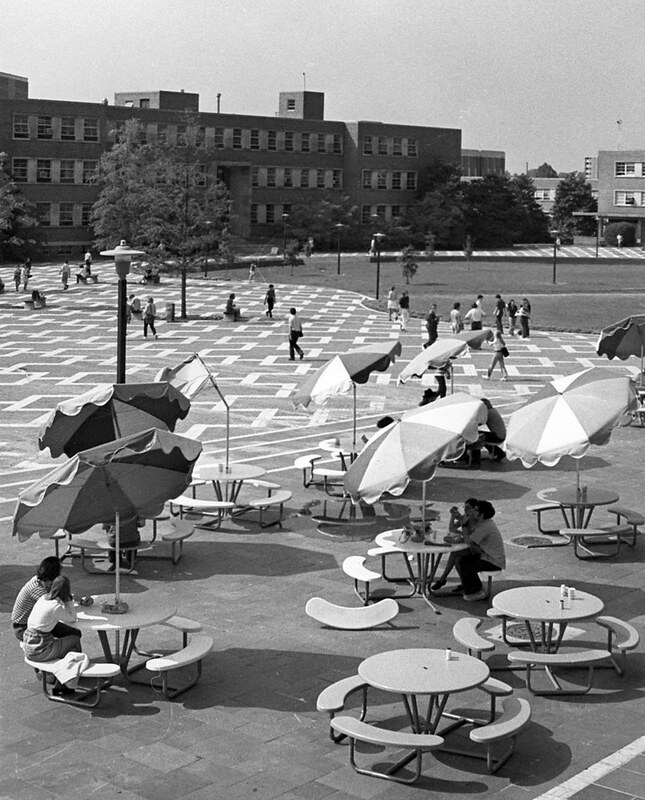 But it took two years to complete what exists now, and Bell’s state-appropriated budget of $160,000 for the beautification project ran out long before the three university bricklayers who built it all could extend as far as Gardner Arboretum. 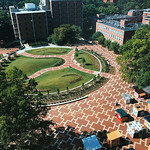 The plaza, made of more than a half-million North Carolina manufactured bricks, took three university bricklayers more than two years to complete. 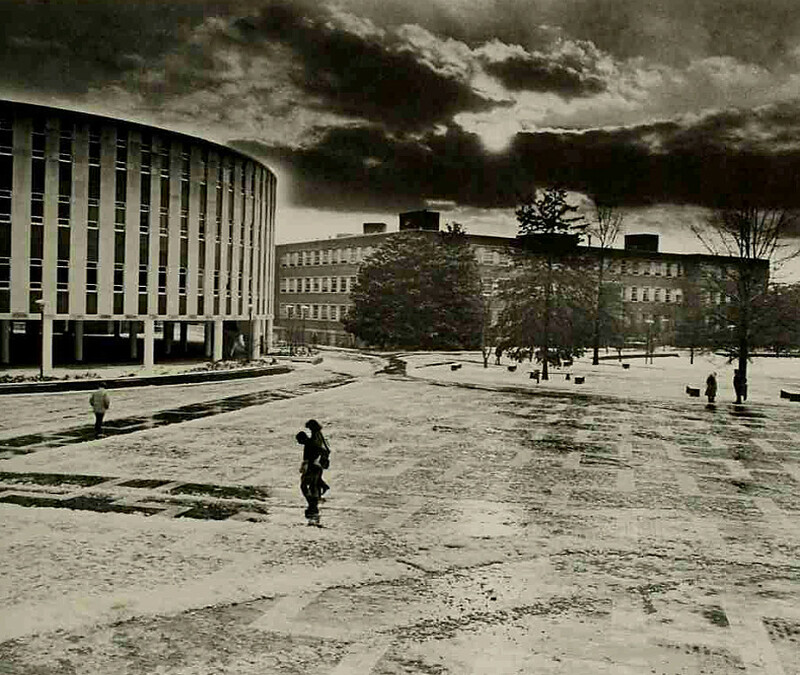 It was dedicated on March 7, 1968, on the 81st anniversary of Founder’s Day. 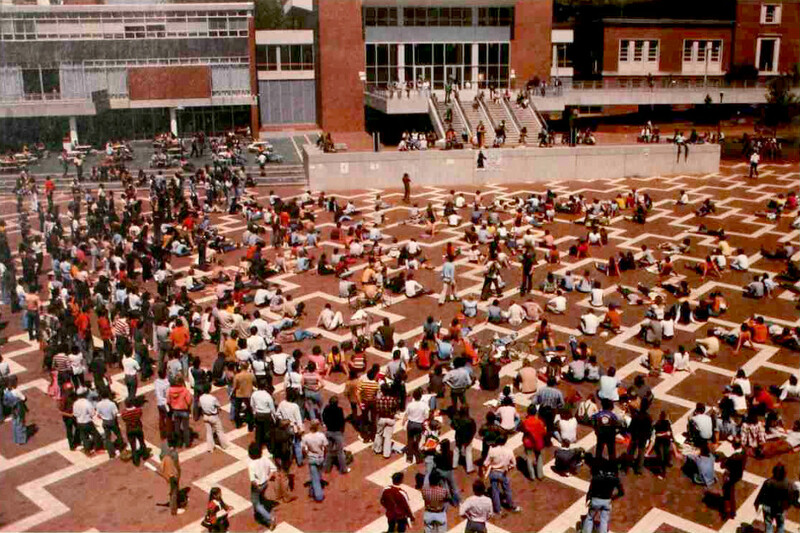 The Brickyard wasn’t always beloved. 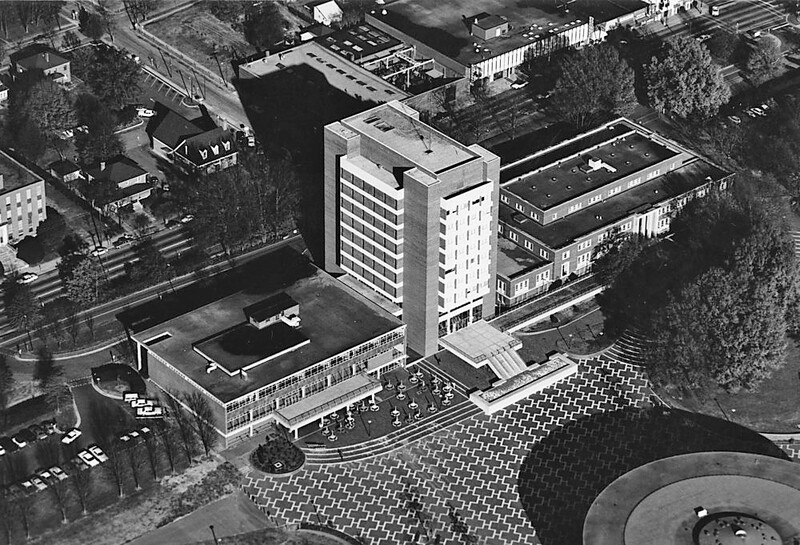 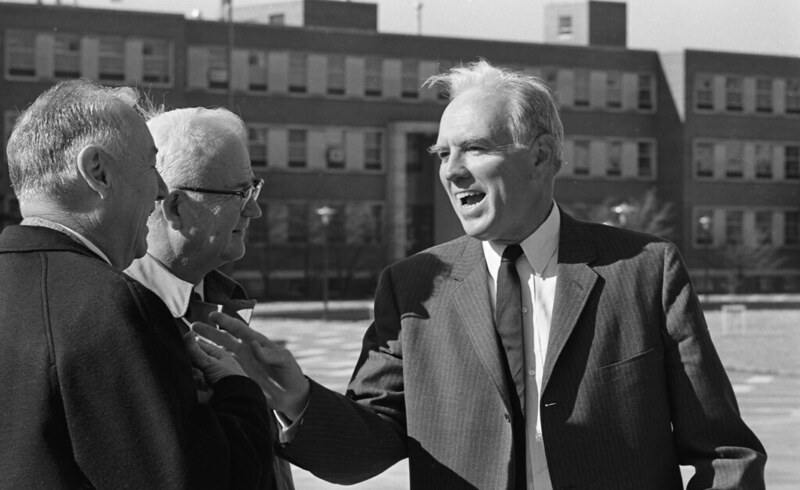 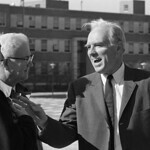 Shortly before it was formally dedicated on March 7, 1968 — the school’s 81st Founder’s Day — by chancellor John Caldwell, former chancellor Carey Bostian and student government vice president Bob Shipley, critical voices had little good to say about it. 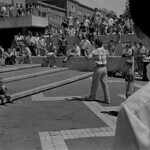 The latter fact proved to be only intermittently true, however. 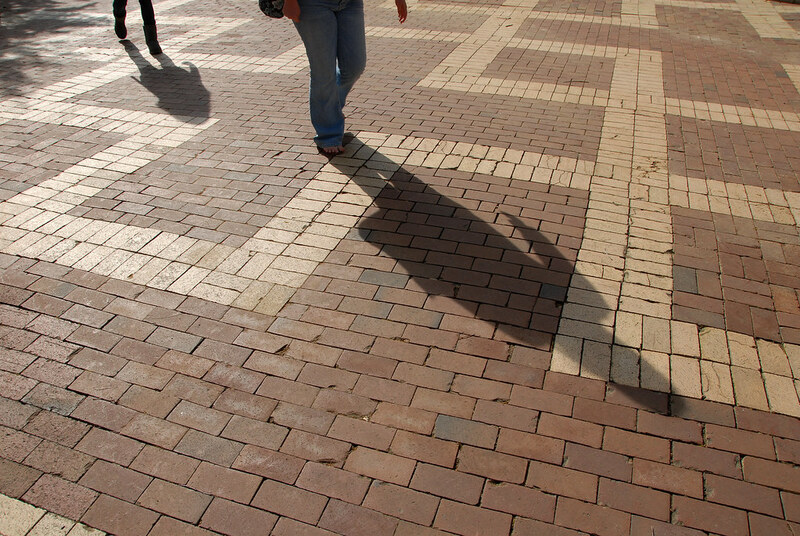 Throughout the plaza’s construction, hard-working bandits rearranged a portion of the bricks into various shapes — sometimes profanities, but usually the school’s block S logo. 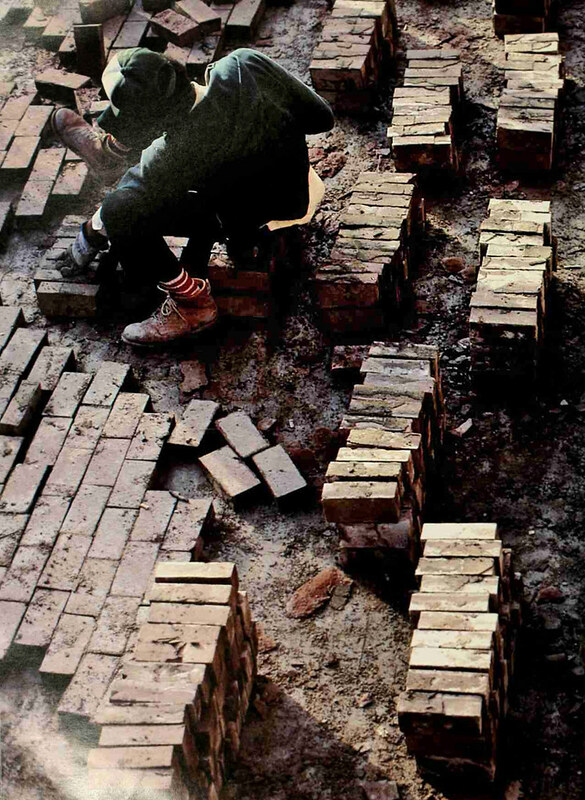 It happened so often that a properly proportioned logo was built permanently into the bricks. 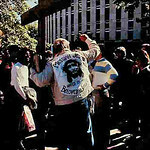 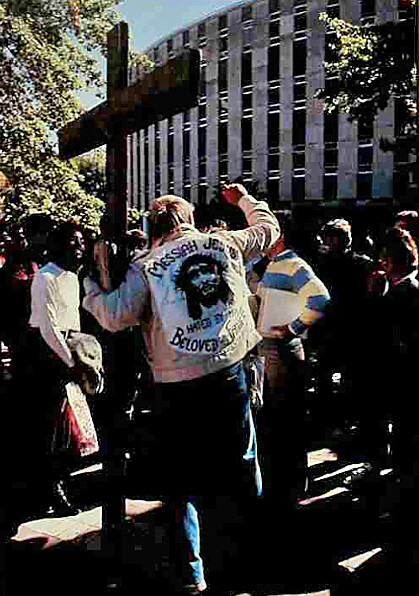 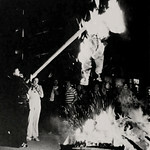 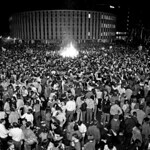 The Brickyard is a place for preachers, teachers, protestors, campaign rallies, concerts and bonfire parties. 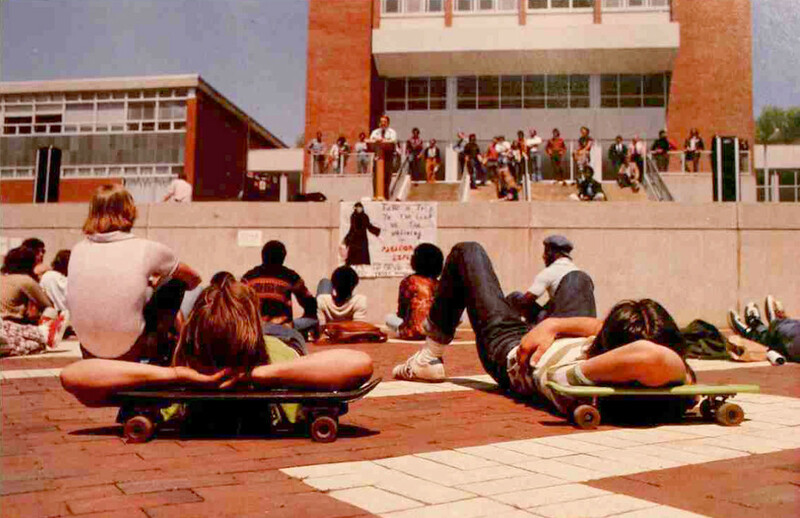 It’s also a good place to grab a between-class catnap with a skateboard pillow. 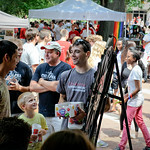 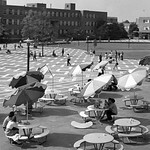 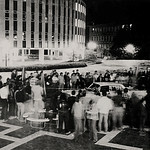 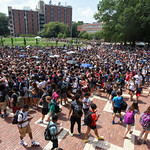 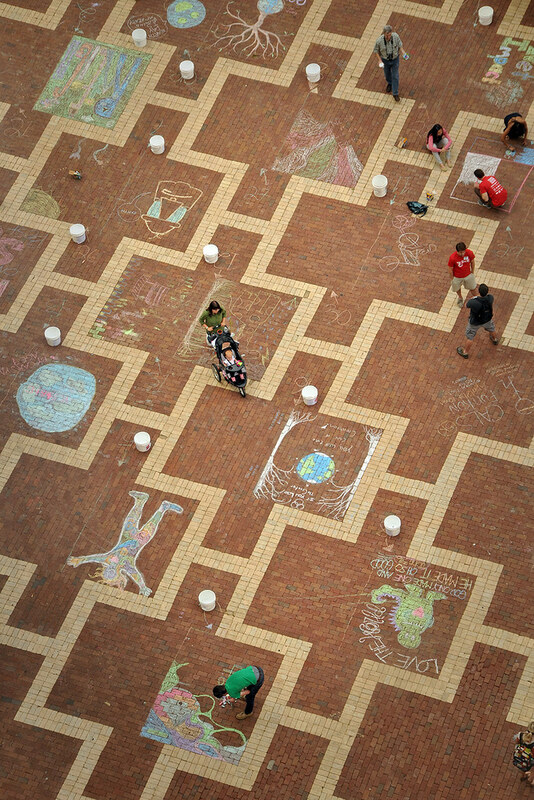 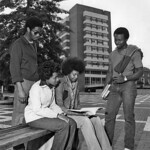 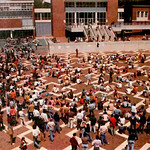 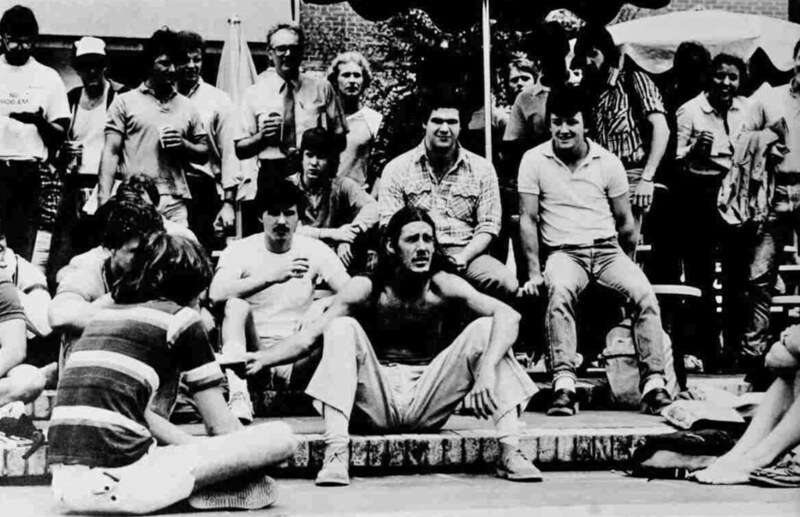 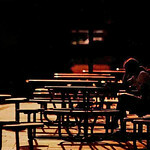 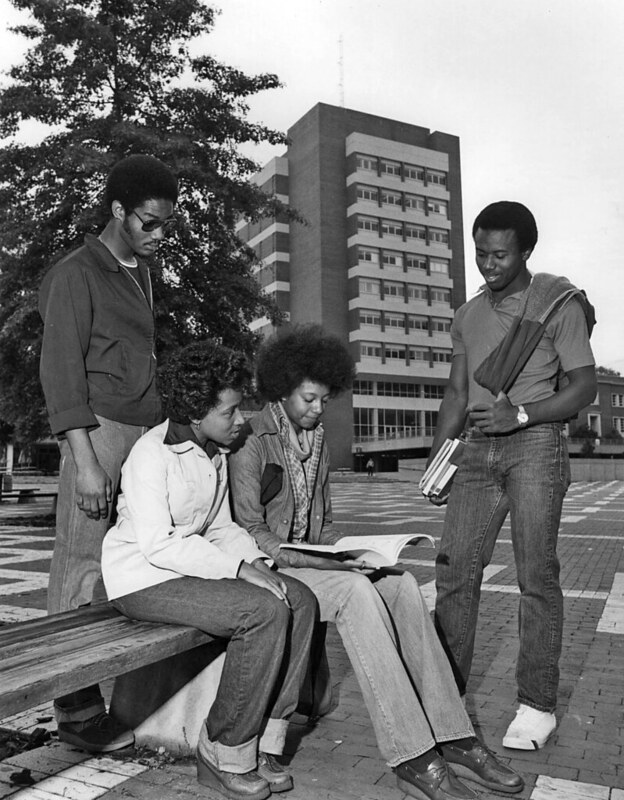 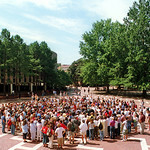 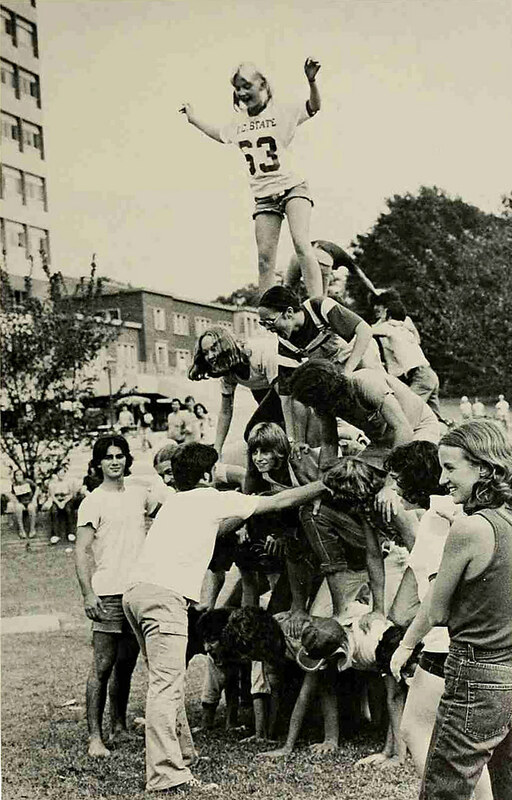 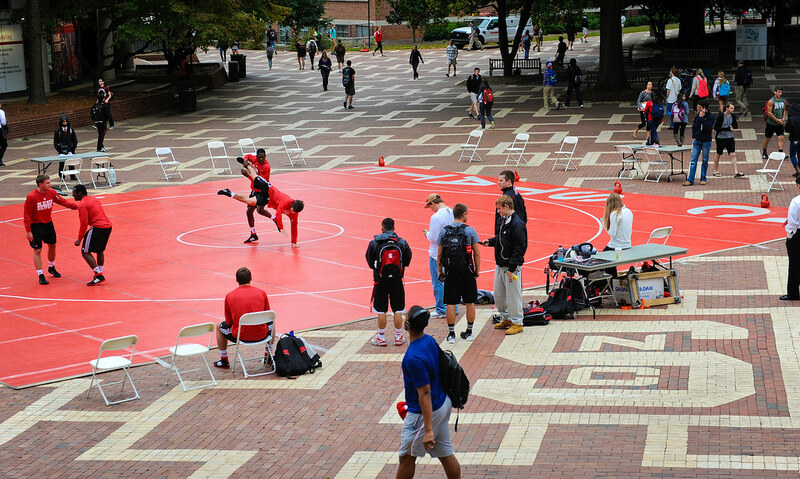 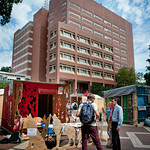 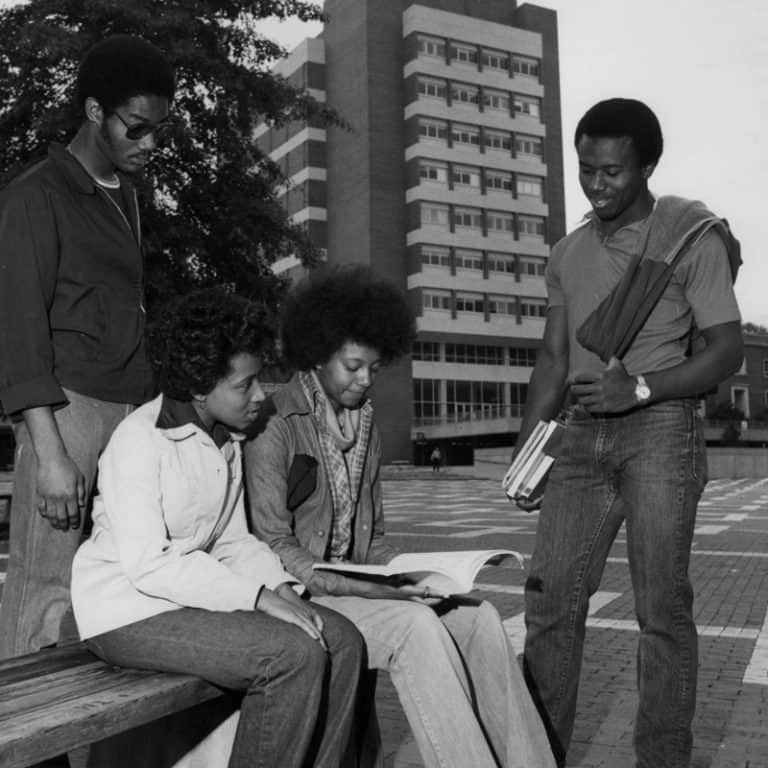 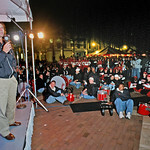 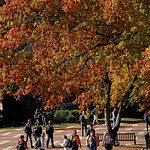 The Brickyard quickly became a gathering place for students. 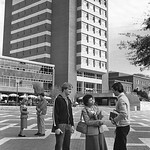 The senior class of 1967 paid $1,600 to build a small glass-and-aluminum informational kiosk for the mall. 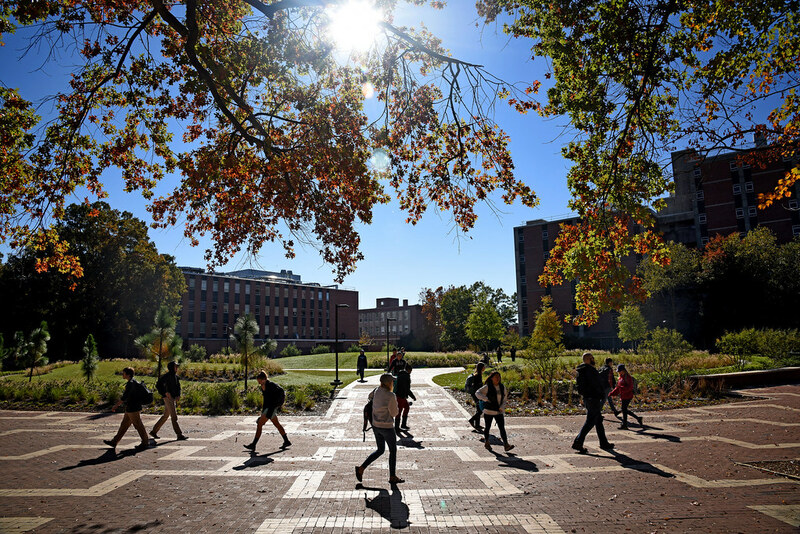 Landscape architecture students, calling themselves the “Green Panthers,” led the effort to raise $5,000 so they could plant seven 30-foot-tall, seven-ton trees in the natural areas adjacent to the Brickyard. 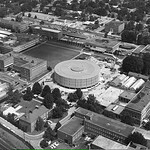 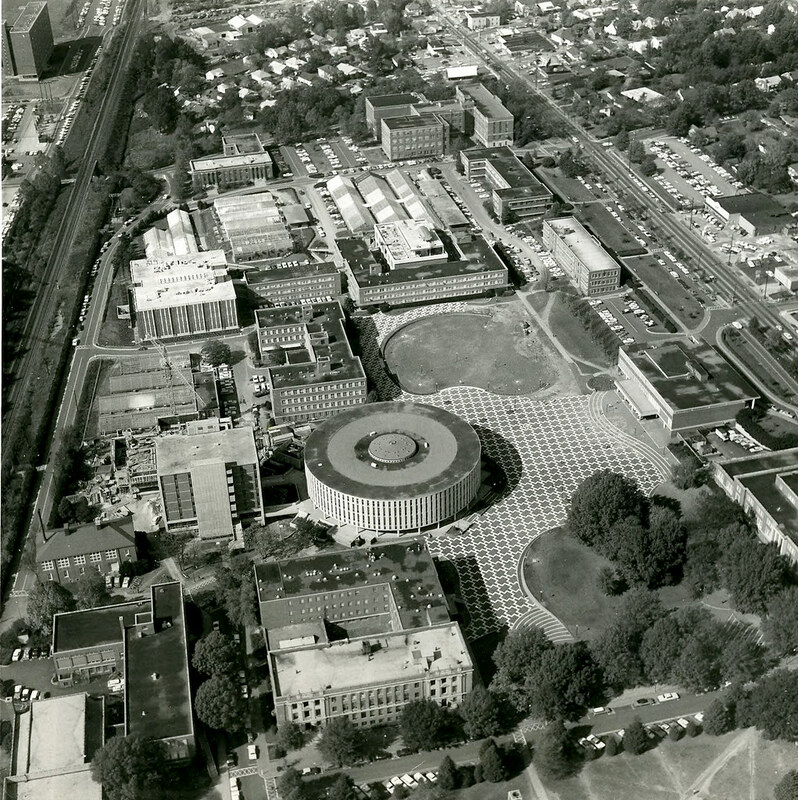 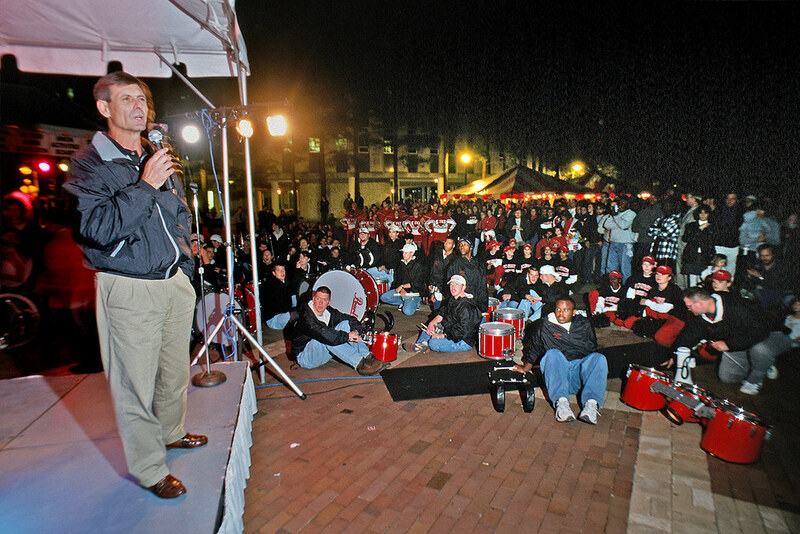 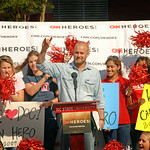 A few weeks after it officially opened, the “brick mall” hosted the third-annual All Campus Weekend, with national recording acts Little Anthony and the Imperials and the Royal Guardsmen unofficially christening it with “Shimmy, Shimmy Ko-Ko-Bop” and “Snoopy and the Red Baron,” respectively. 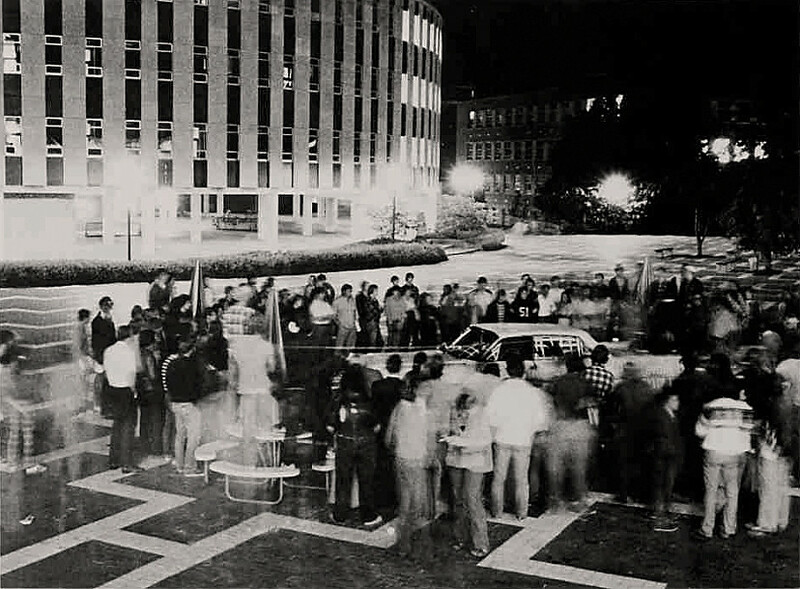 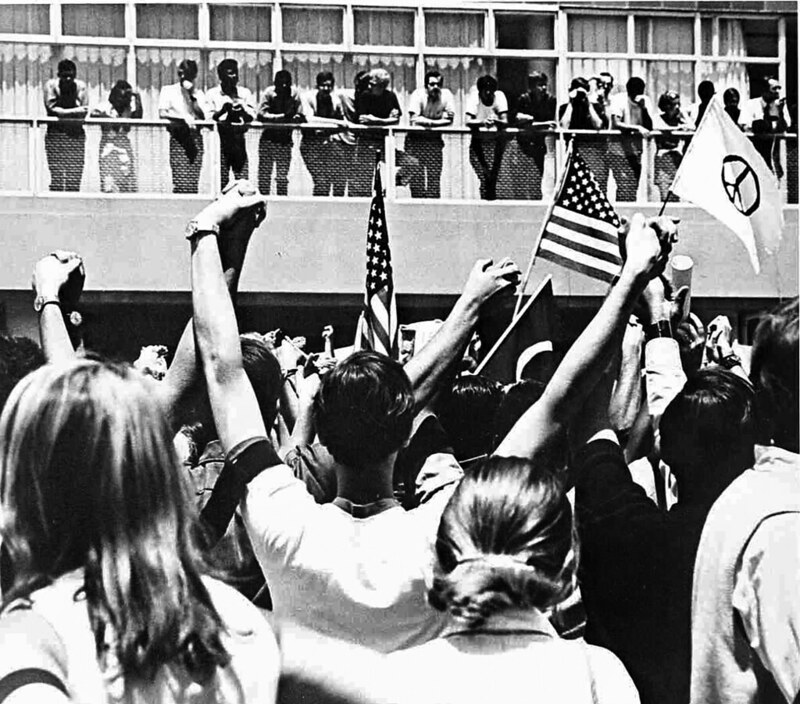 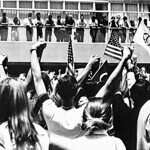 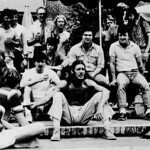 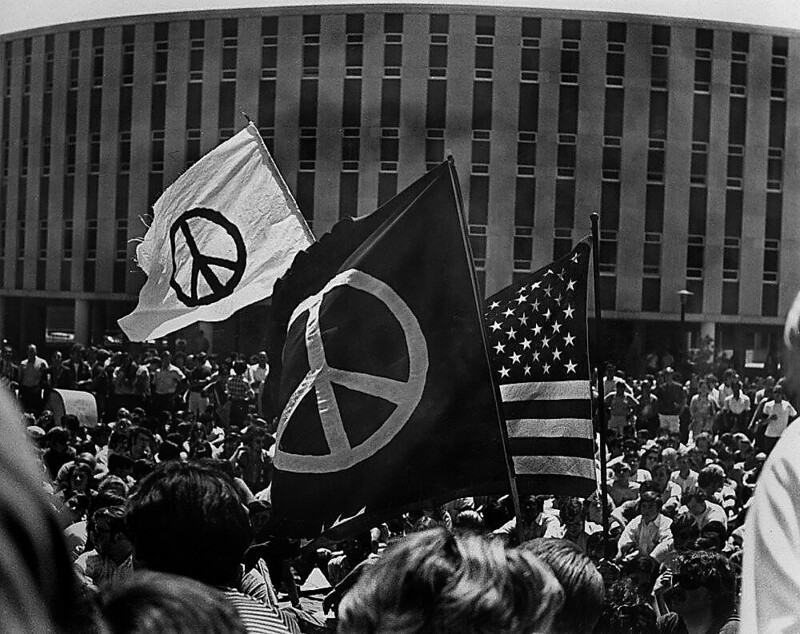 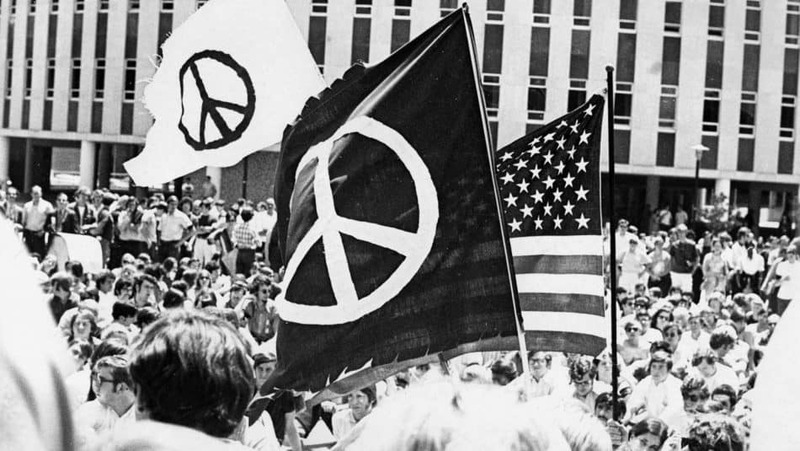 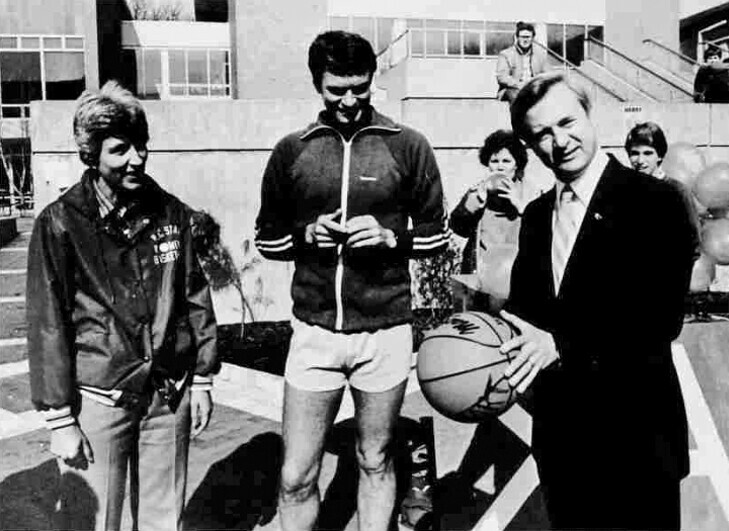 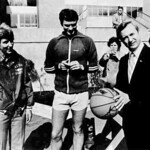 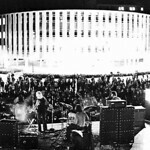 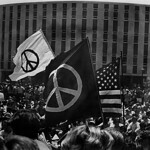 Throughout the turbulent 1970s, thousands of students gathered on the Brickyard to protest the death penalty, the expansion of the Vietnam War into Cambodia and an appearance by Vice President Spiro Agnew at Reynolds Coliseum, as well as other political and social issues of the day. 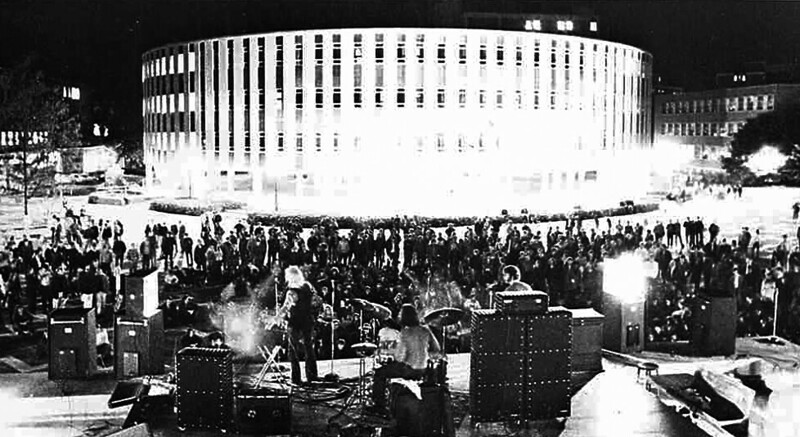 Concerts gave way to other uses. 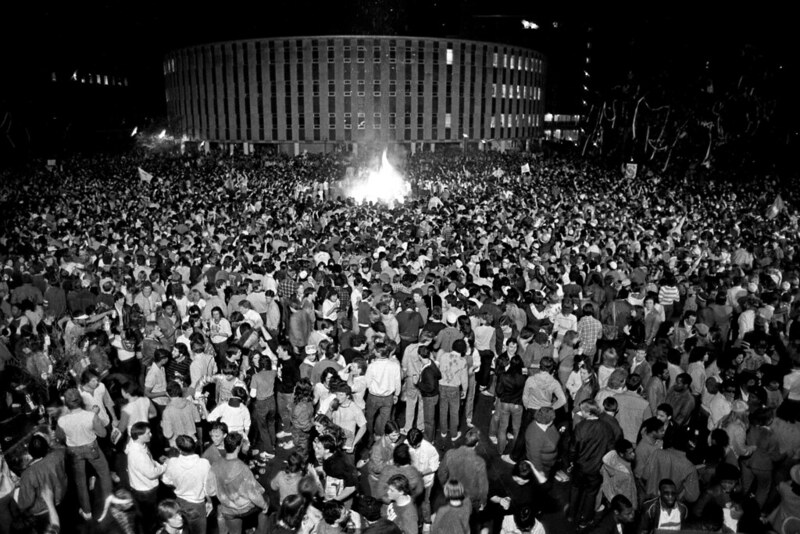 In 1970, student body president Cathy Sterling and 6,000 student protestors from NC State, Meredith and UNC-Chapel Hill left the Brickyard for a two-mile march to the State Capitol to protest the expansion of the Vietnam War into Cambodia. 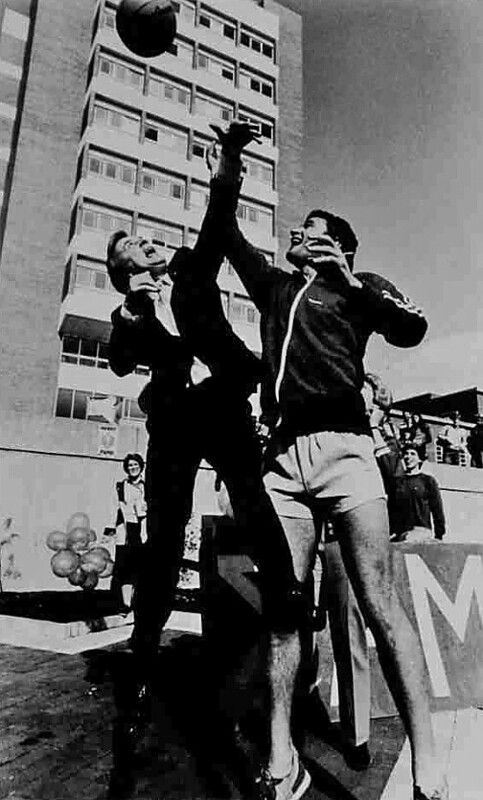 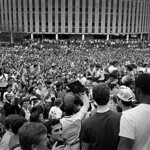 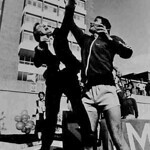 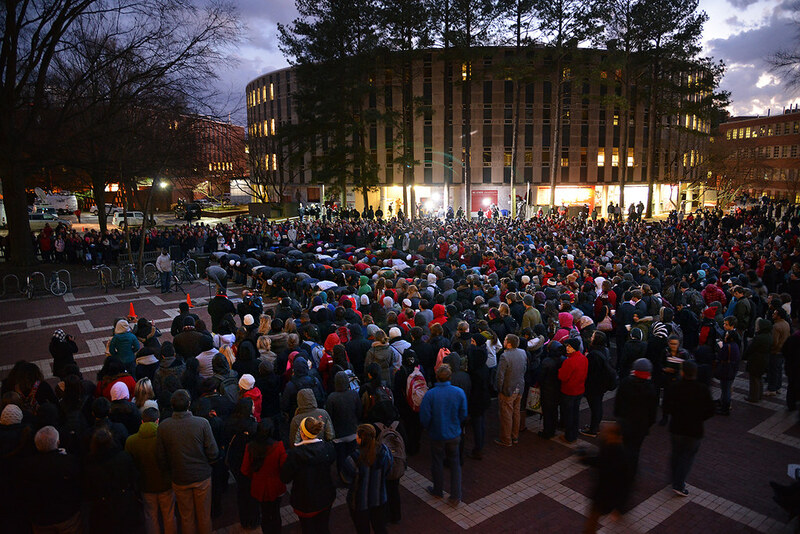 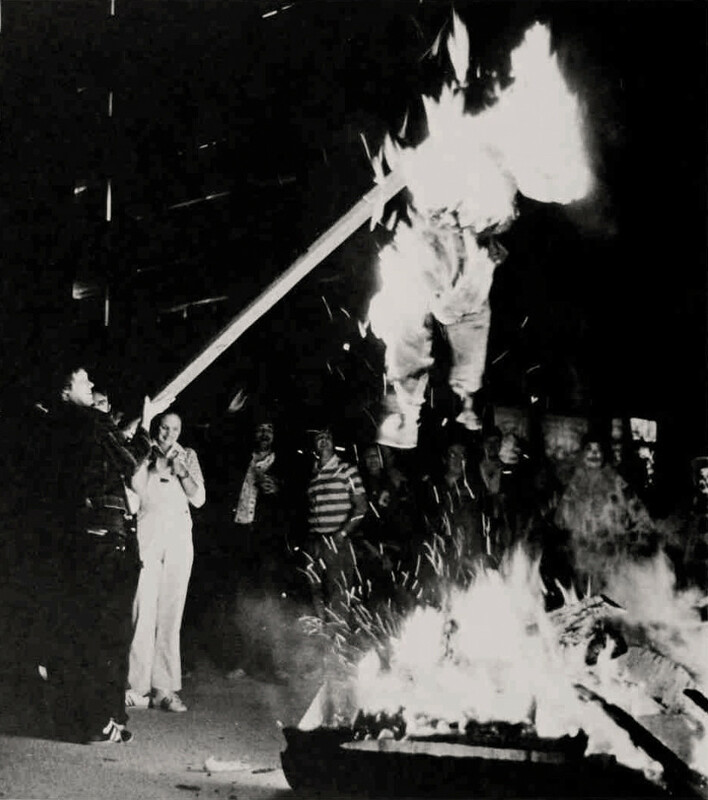 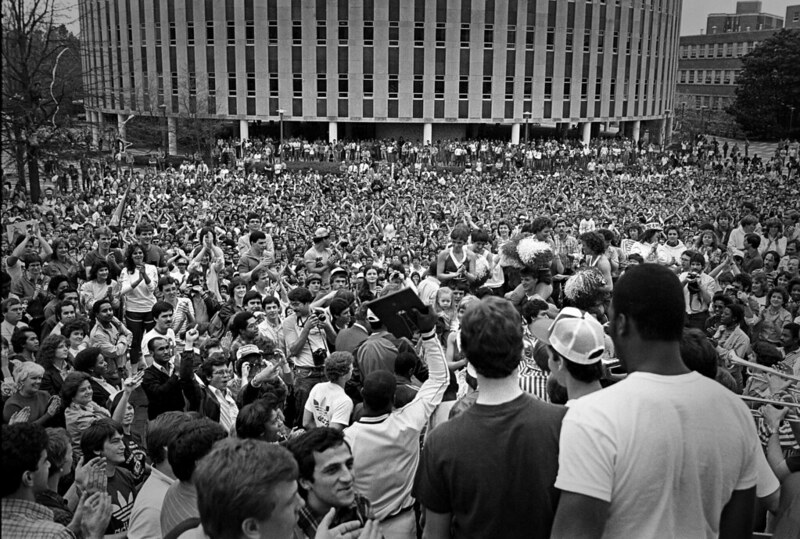 In 1983, as head coach Jim Valvano and his Cardiac Pack won game after improbable game, the Brickyard became host to epic planned pep rallies, spontaneous bonfires and general celebratory rowdiness. 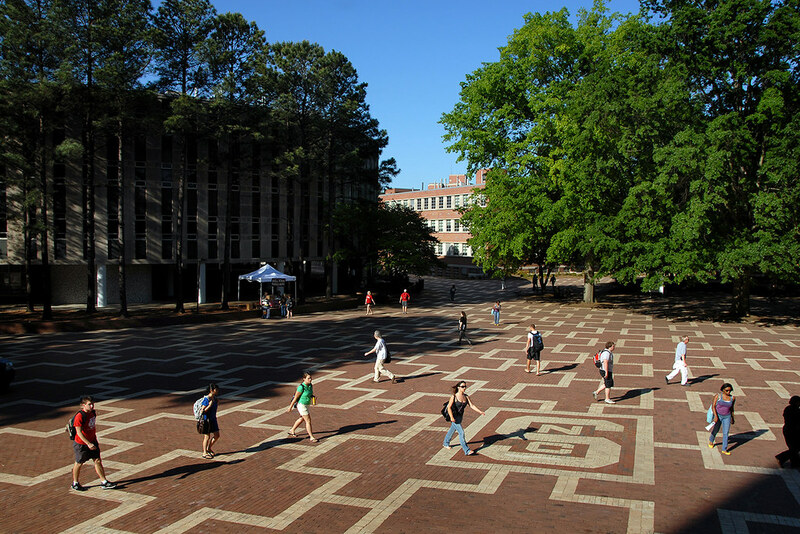 Landscape architect Richard C. Bell was hired to spend $160,000 state-appropriated funds to beautify 10 places around campus. 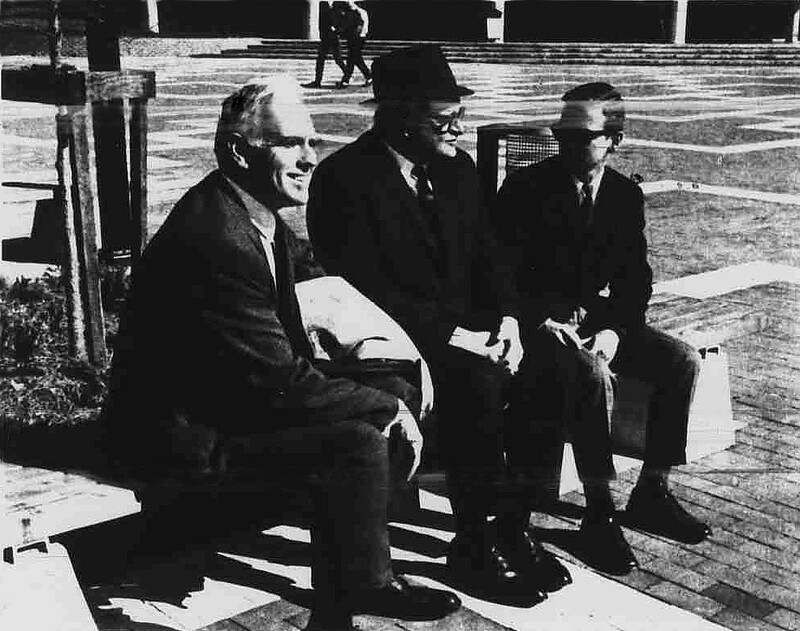 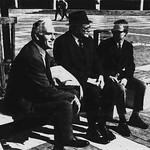 He convinced Chancellor John Caldwell to let him spend those funds to create a plaza inspired by Venice’s Piazza San Marco. 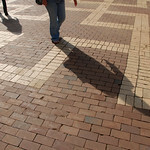 Each of the Brickyard's 588,060 was laid--or replaced through the years--by the hands of university bricklayers. 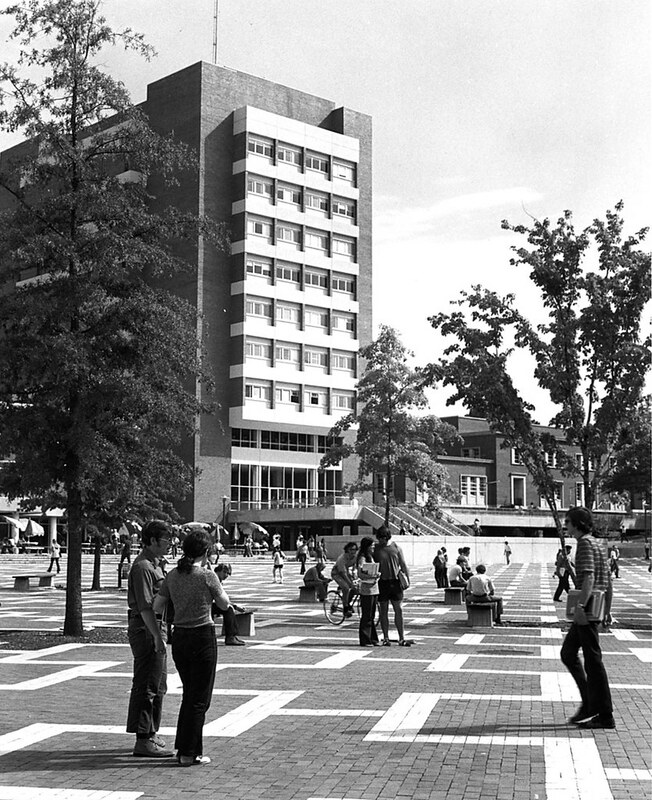 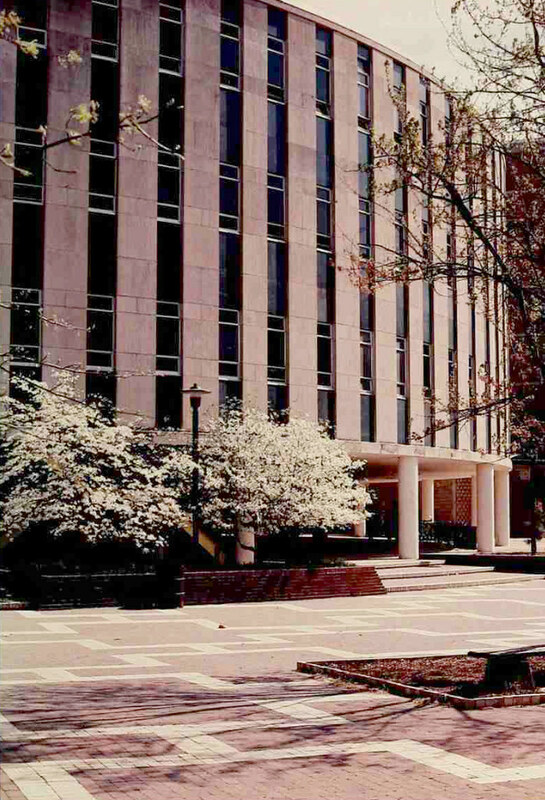 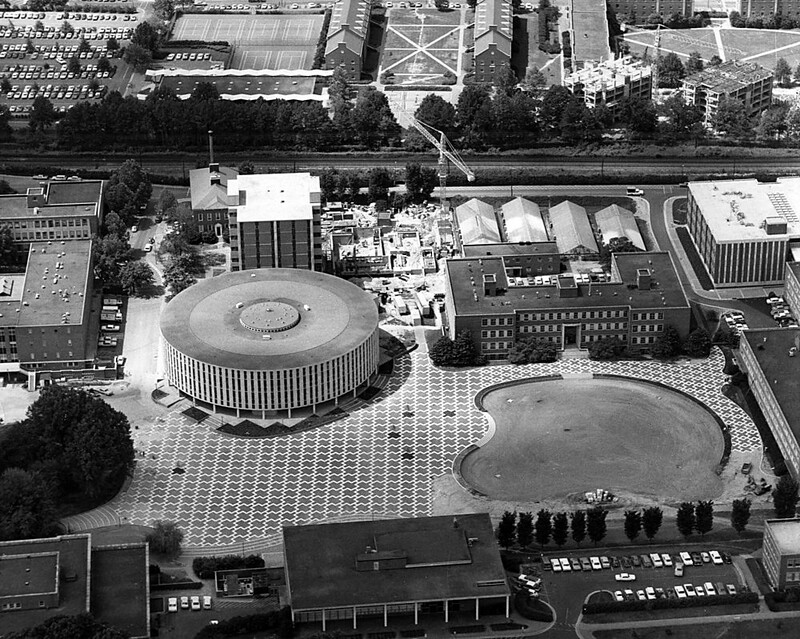 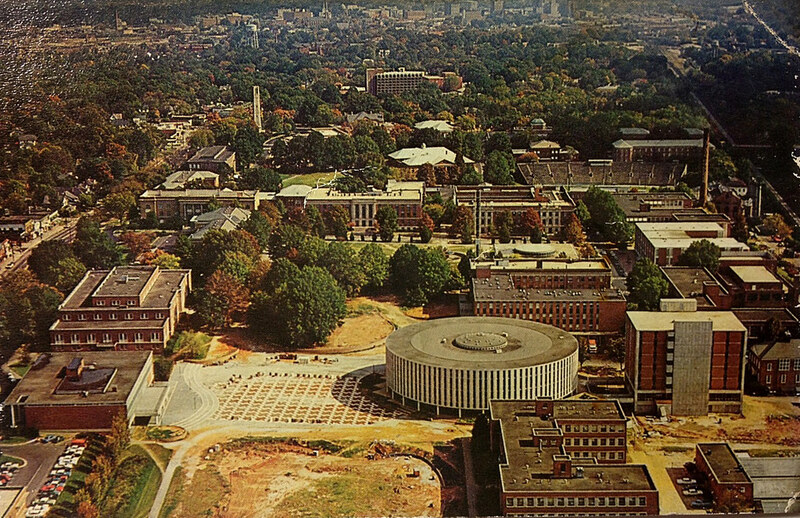 Shortly afterward, the plaza was cut nearly in half to build a second book tower for D.H. Hill Library, encroaching toward Harrelson and sacrificing outdoor roaming room for indoor study rooms. 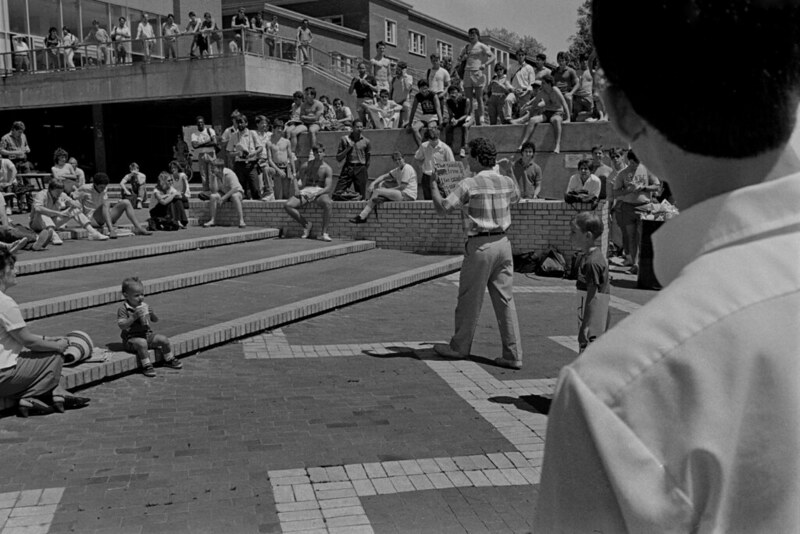 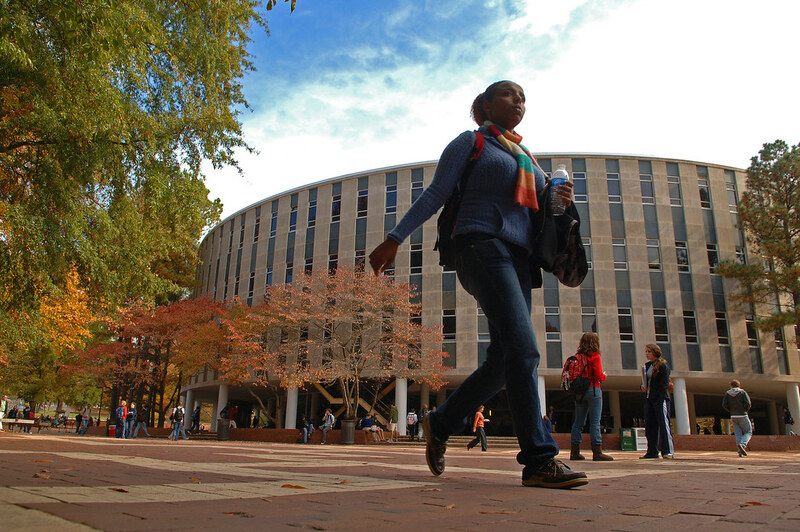 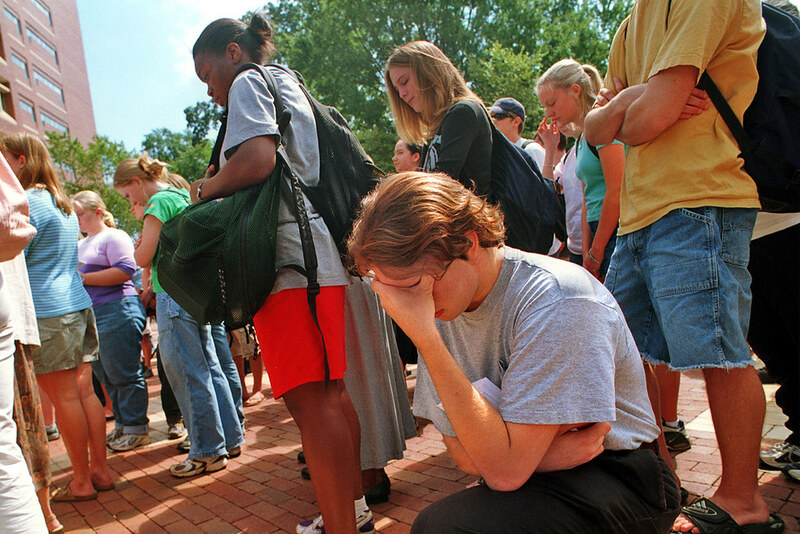 Nevertheless, the Brickyard remained an important part of daily life on NC State’s campus. 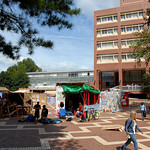 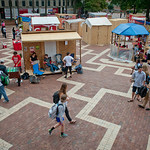 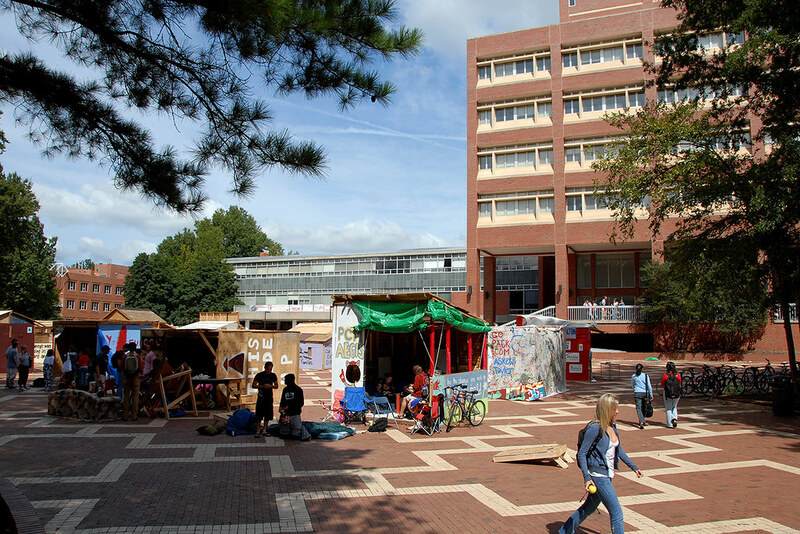 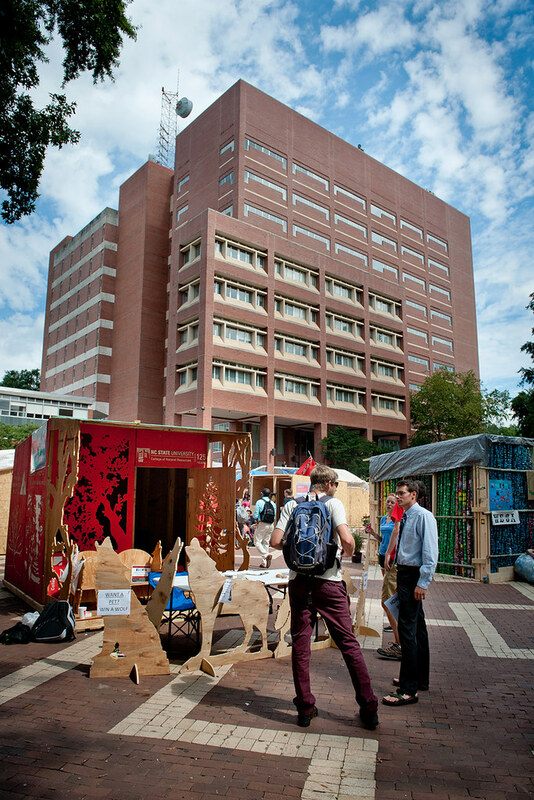 In recent years, it has become the comfortable home of Shack-A-Thon, a week-long hobo village that serves as a fundraiser for the campus chapter of Habitat for Humanity. 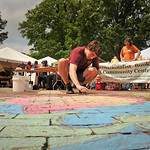 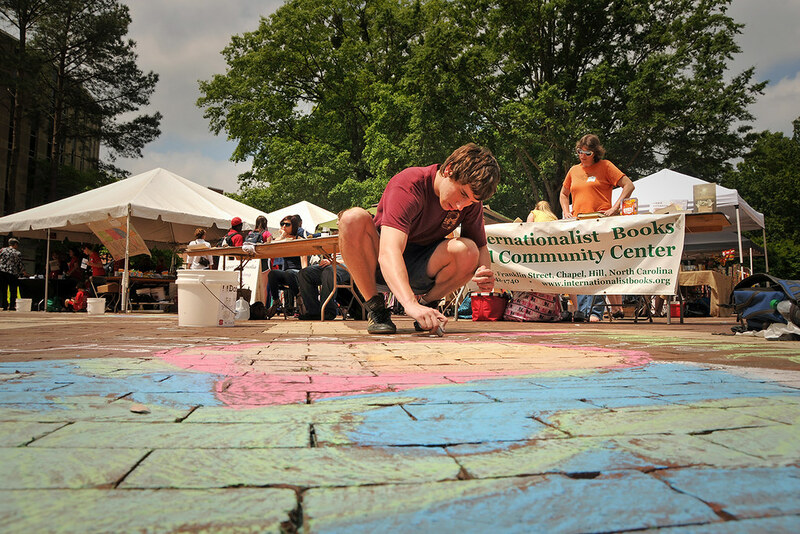 It’s also the home for the school’s annual Earth Day celebration and has hosted a weekly farmer’s market. 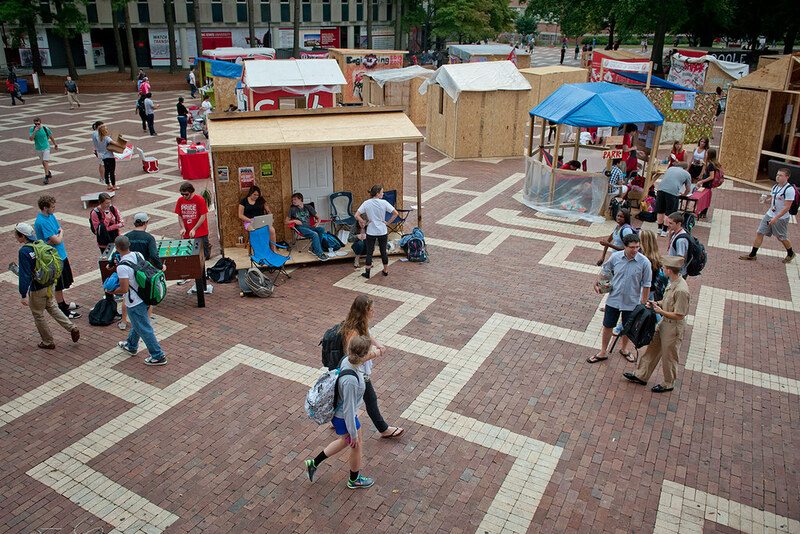 Last year, as the final pieces of demolished Harrelson Hall were removed from the Brickyard, its footprint was filled in by a temporary greenspace and footpath, making the Brickyard and surrounding areas the perfect space for thousands in the community to squint at the Great American Eclipse. 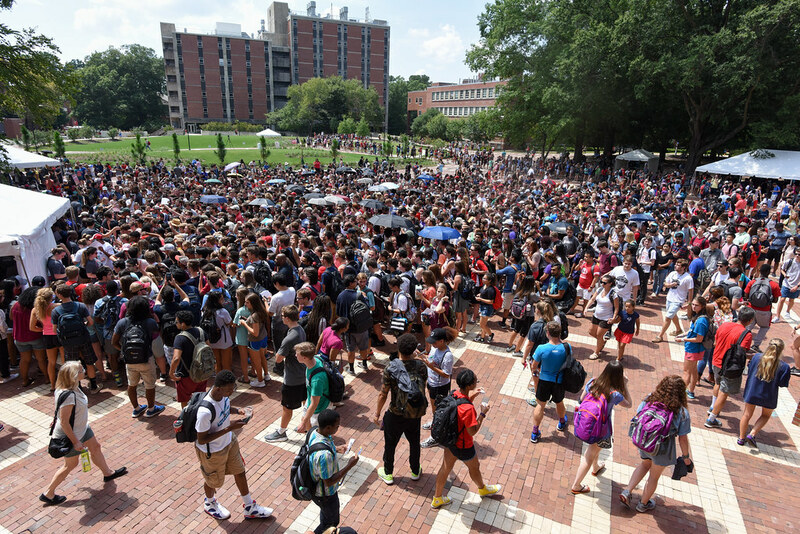 Perhaps the largest gathering in Brickyard history was on August 21, 2017, when thousands of students, employees and community neighbors gathered there to take in the Great American Eclipse, which was at 95 percent totality through most of central North Carolina. 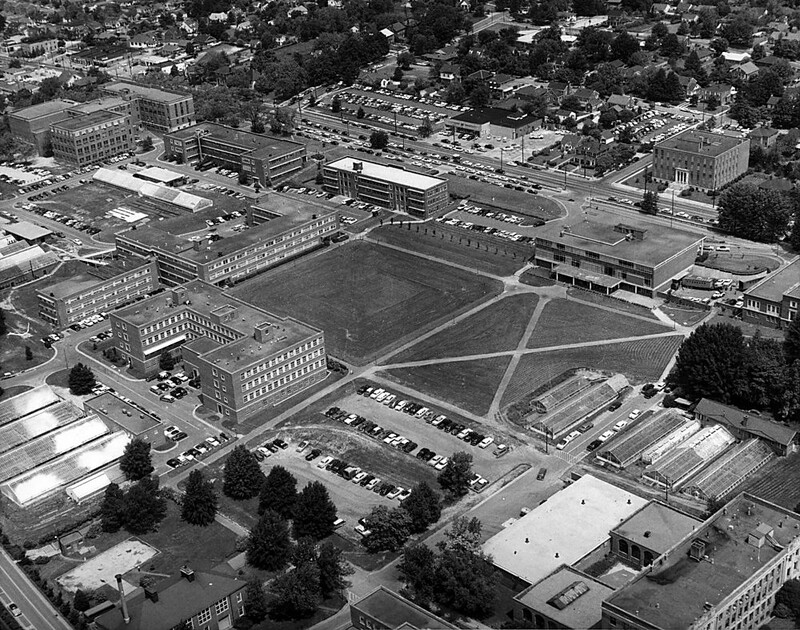 At most, the 45,240 square feet of the Brickyard can hold about half of the university’s current student population at any one time. 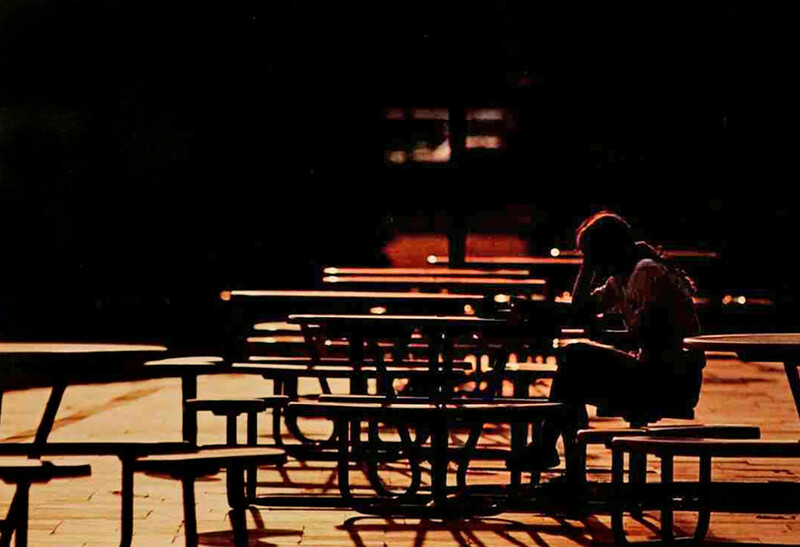 But it is a daily home to all of them. 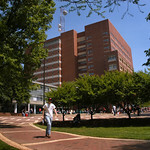 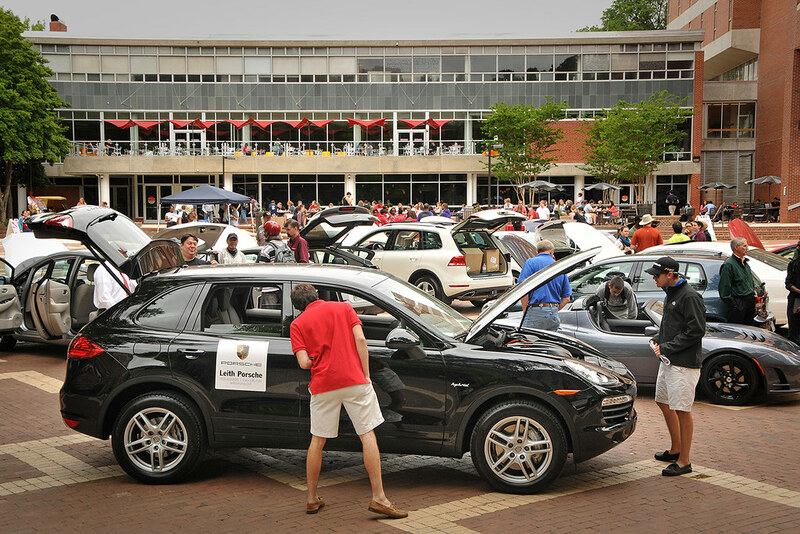 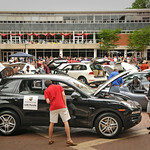 Every year, the Brickyard loses between 500 to 600 bricks to theft. 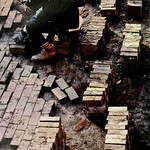 Another 575 to 650 bricks are annually replaced due to damage, erosion and tree-root interference. 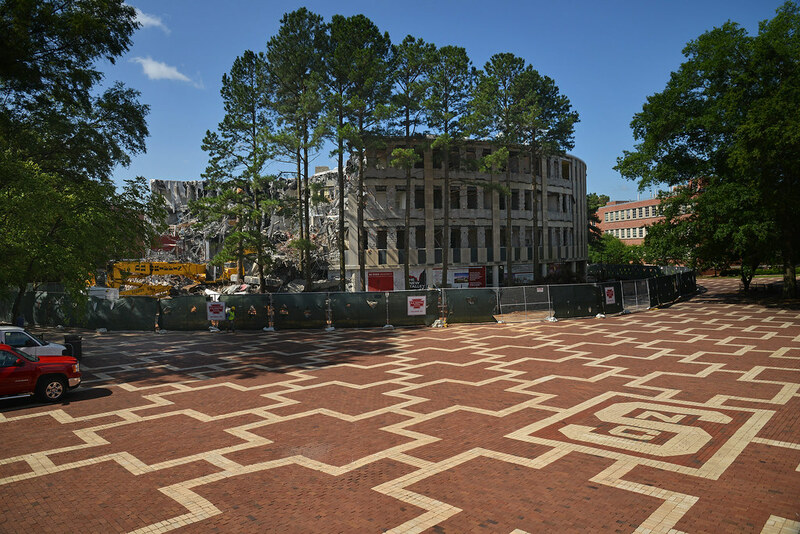 As part of the NC State Grounds Services’ Re-use and Recycle Initiative, students can request souvenir bricks at gr-brick-crew@ncsu.edu. 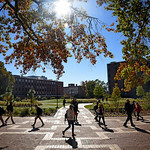 Surplus bricks are also available near the Brickyard at the end of each semester for graduating students to take a piece of campus with them — without damaging property. 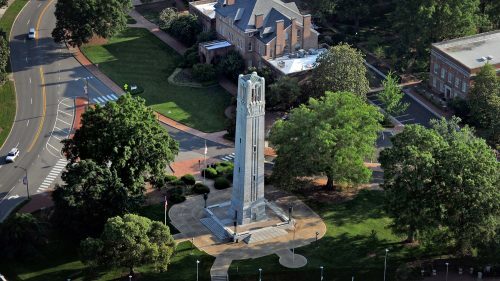 Built to pay tribute to those who fell in past conflict, the Belltower has become a symbol of inspiration to the Wolfpack community. 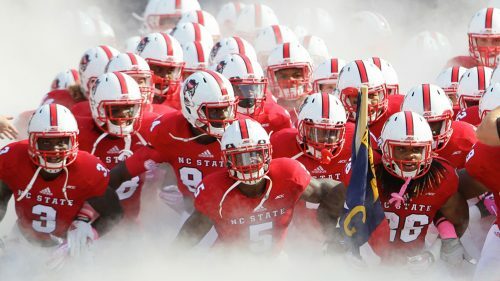 For the longest time, Carter-Finley Stadium was a dream. 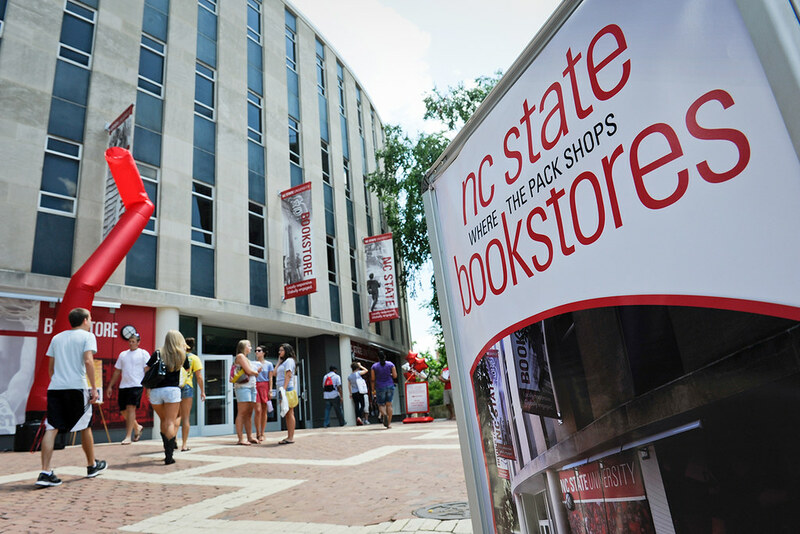 Now, it's the perfect home for almost 60,000 NC State fans.